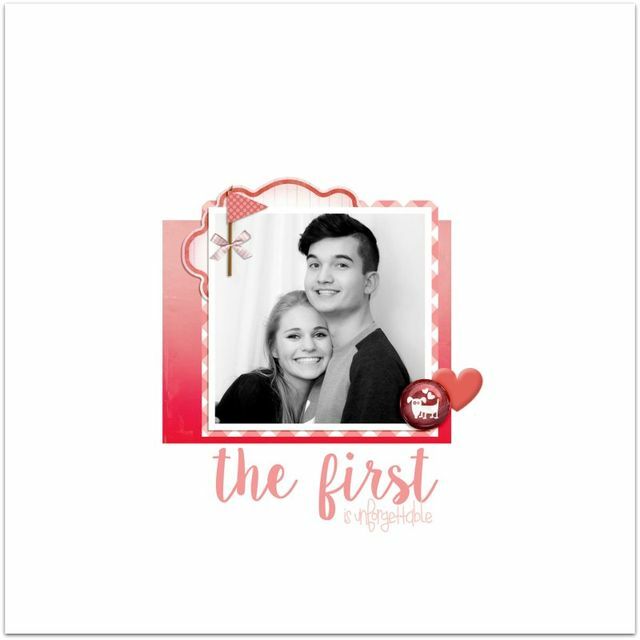 Did you enjoy seeing the love in the air this month? We thought that the gallery was endearing and tender. And hopefully inspirational for you as well. Shall we find some specific things that we love in each layout? Let's do it!!! Sometimes its the subtle things. Marnie's placement of the flag in the top left balances the smaller height of the left side of the photo, while the embellishments in the lower right balance the height of the flag. Using the embellishments as counterbalances to the people in the photograph gives a solid center. There are so many great elements in Celeste's design, but the magical one is the clear title. There are patterns and colors, and designs, and shapes, and then one quiet clear title. And its transparency, the thing that should make it most disappear, is the thing that brings it to center stage as it is so different than all the other elements. And because it is right on the photo, overlapping both of them, you know it is them of whom it speaks. Awesome. Sometimes a quote is just so good it needs a whole page. And this is one of those quotes. Let's look at all the things Cristina executed with perfection: right justifying the quote, stamping "I Choose You" in pink, using a linear stack of photos to offset the horizontal waves in the pattern, choosing three small photos rather than one large so as to not compete with the quote. So many things done well that together make for a fabulous spread. 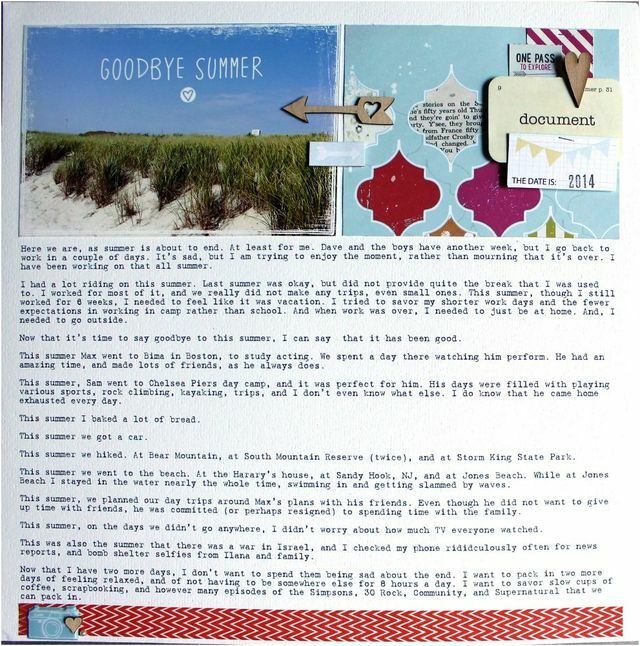 If you haven't gone to Amy's blog to read her journaling, you should. Actually, go right now. We will wait. 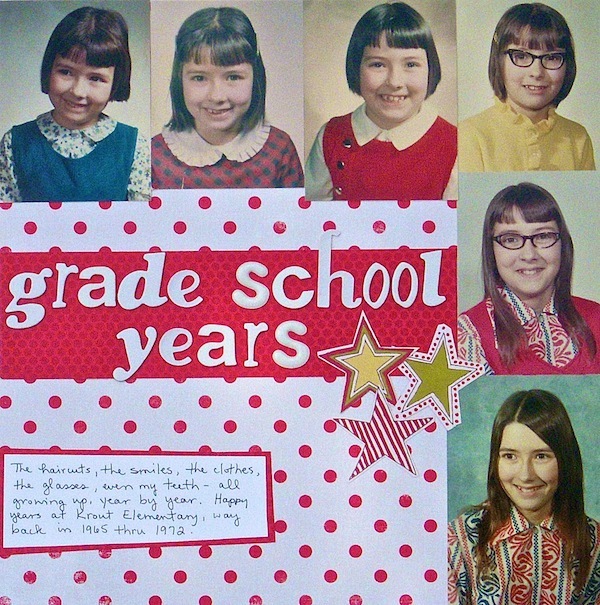 One of the tricky things about scrapbooking old photos is picking the right papers. Diane found valentine's tones that completely evoke the sense of the seventies without being kitschy. 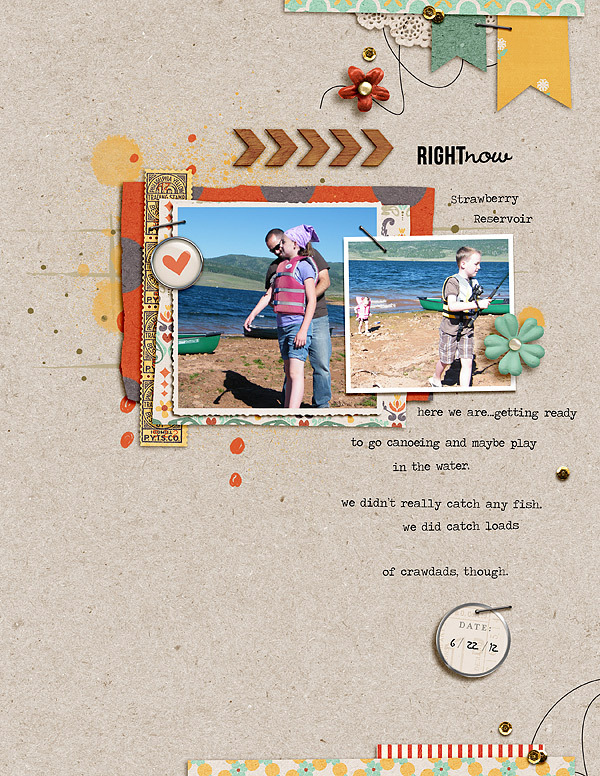 Then her seamless use of flair, pearls, rhinestone, and stitching give her layout a timeless feel. And did you notice the conversation heart? Man, she is so good at the little things. Just so good. 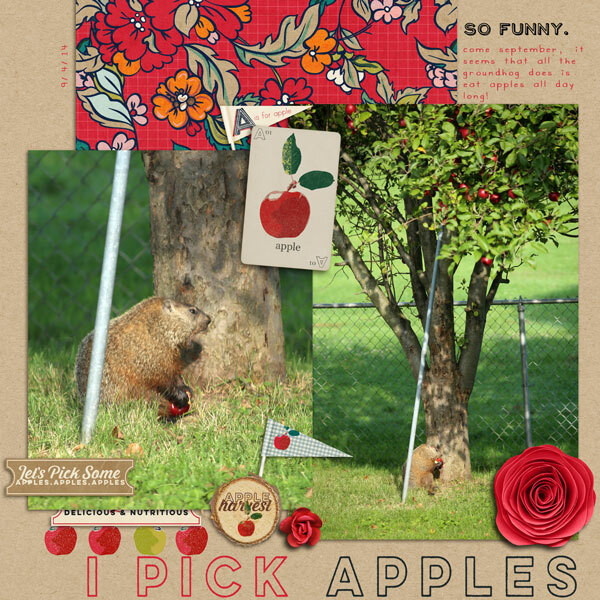 Not only did Lisa make all these patterned papers for her layout, but she also kept her color scheme monochromatic allowing her red flowers to take center stage. Just where red flowers belong! Lisa was also very smart in keeping her patterns small on her circles so that they didn't fight against the large chevron in her photo. 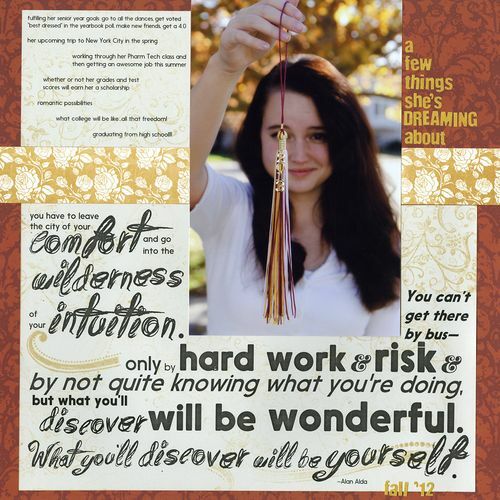 Instead, they are on a similar scale to her handwritten quote, which makes for a lovely backdrop. These are the moments that we will want most to remember. Not only does Jennifer take time to be a great mother, but she also takes time to documents why is is so special. These are the photos that we might not have had in the past with cameras being bulky and seemingly rude. But now kids take pics all the time, everywhere, so our teens are much more likely to say yes to a photo such as this. 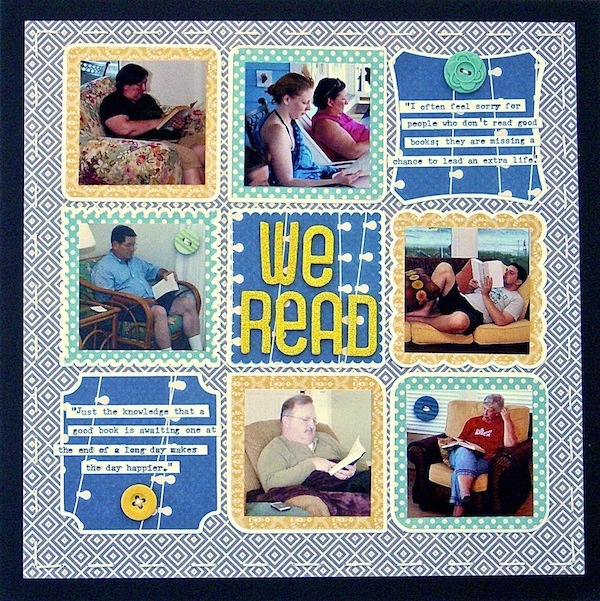 Which means we are much more likely to scrapbook a page such as this. Such a win win! In Aliza's post, she said she was "looking for a way to say something meaningful and authentic, something a little deeper than “I love you,” but nothing too serious." 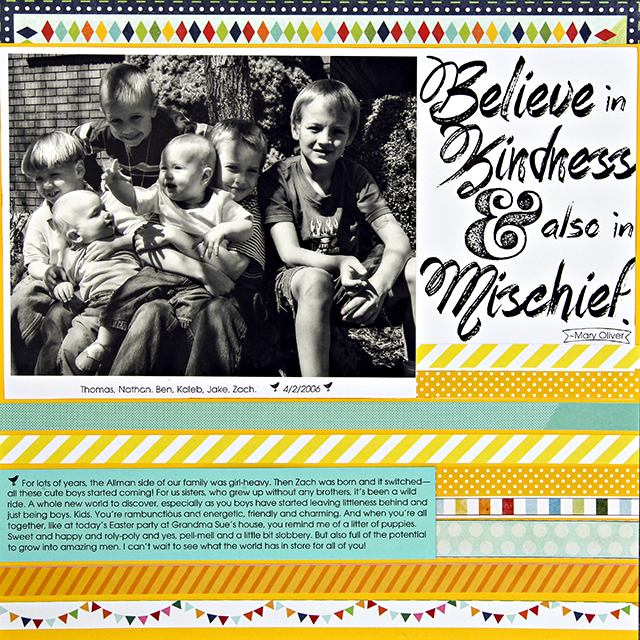 And she ended up with "My People" and the sweetest (yest not one bit sappy) journaling. 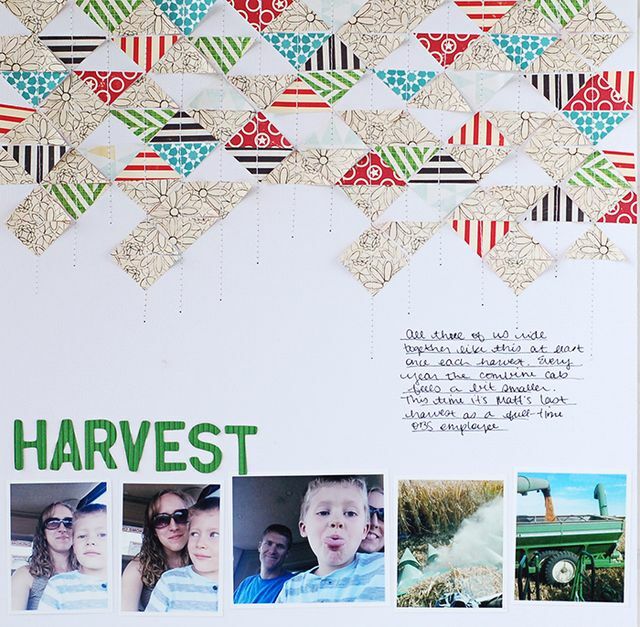 There is much to love about her take on a family photo and honoring our family with love and kind words. Meaningful, authentic, and not too serious. Just what she wanted. And now what we all want. And it is with heavy heart that we bid a sad farewell to Diane and Francine. We will miss you both. So much. Your kind hearts and creative souls have blessed our site for years. And we absolutely would not have been the same without you. Diane, you use color like none other. Your pages are as happy as your outlook on life. 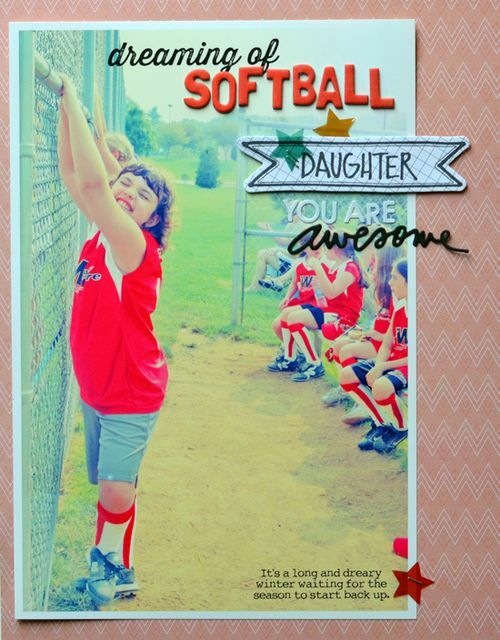 Your children are beautiful and you document them in ways that both honor and celebrate their teenage lives. Your world adventures are enchanting and we all wish we could accompany you. We will try to maintain our cheerful quotient without you, but it our rainbow will be more subdued with you gone, for certain. Francine, you have been here since the beginning. Your pages are filled with sunshine, and memories. With sisterhood and motherhood. With a life real and lived and loved. You are a master of the elements found, and your pages have little additions sprinkled on top that help tell your stories. 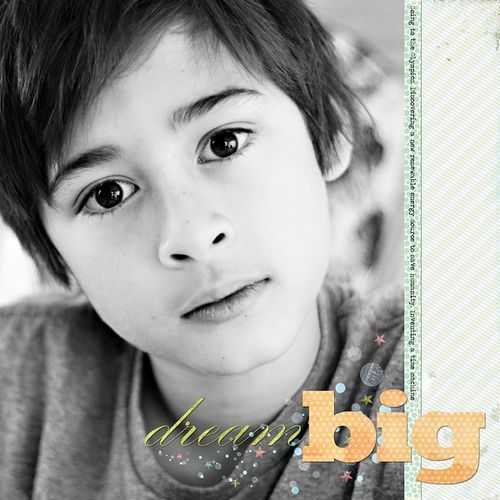 We have seen Kieran grow from a tiny baby to his grand nearly 6 year old self. We thank you for demonstrating balanced motherhood sprinkled with grace and brilliance. Are you having a fun month making use of the things in your desk, and drawers, and boxes, and closets? Are you falling back in love with a tidbit of a paper you had forgotten that you loved? If so, this month is already a success! It is our final October Saturday. Which means there are only a few more days to stock up on candy and to prep those little witches and goblins! And it also means that today is our day to look back through our gallery and find some things to love and inspire. Got your notebook out? Perfect. 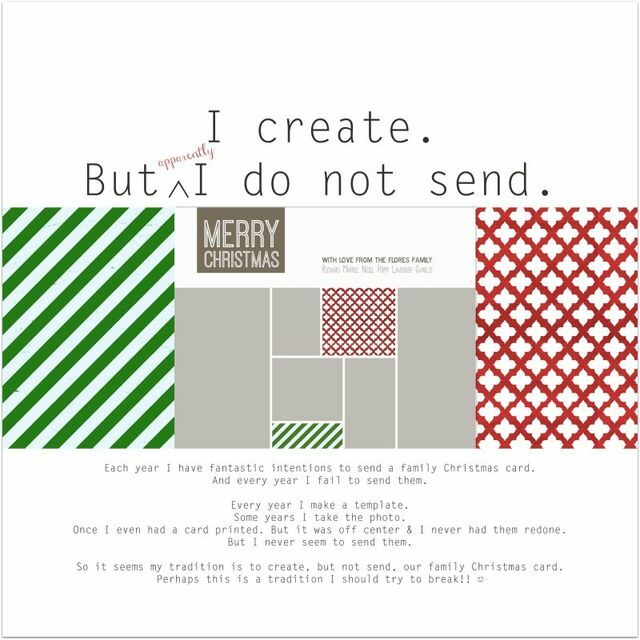 Let's go make a list of ways to use our scraps! 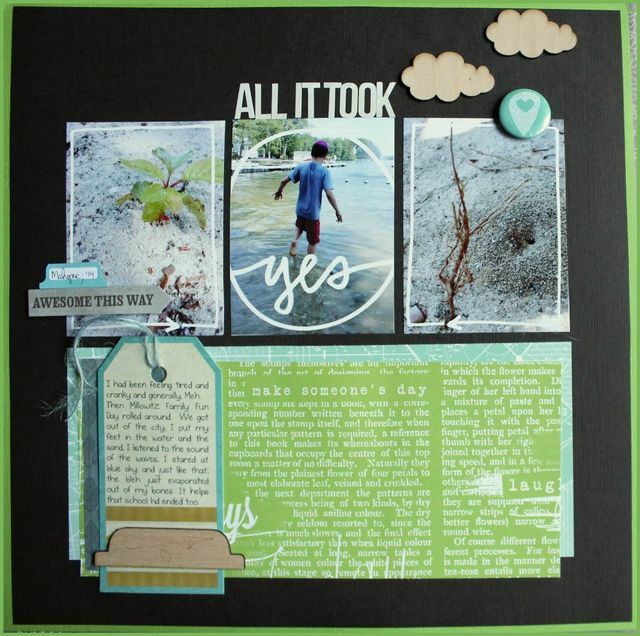 We love how Aliza used kit leftovers in preparation for getting a new kit. We know how new equals shiny so it is good to finish up with as much "old" as we can before new takes over. 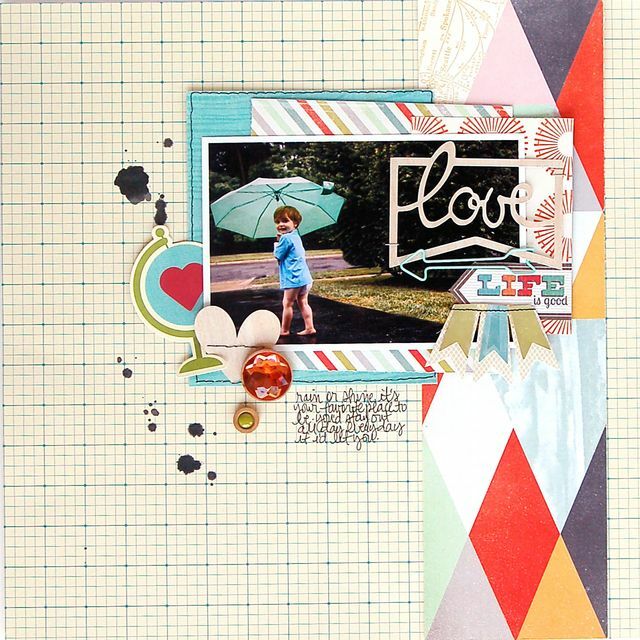 Background cardstock is the perfect holder for adding scraps. And digging through your scraps drawer is the perfect activity when you need to find a treasure! Lisa made quick work with her punches. The tiniest bit of leftovers can make a bit impact. Keeping the leftovers from one scrap project together in a pile helps create a group of coordinated scraps all ready to go for a new project. Great idea, Diane! 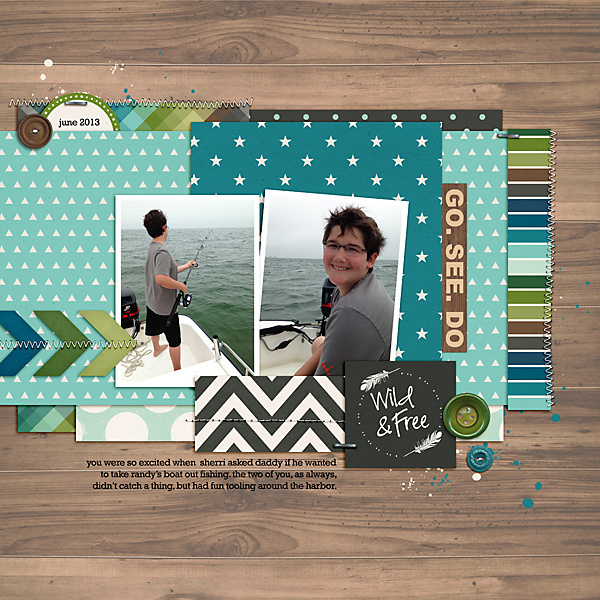 Sometimes we buy a digital kit to make a specific layout. And then forget to use it for awhile. It's fun to get it back out and see how you still love it! 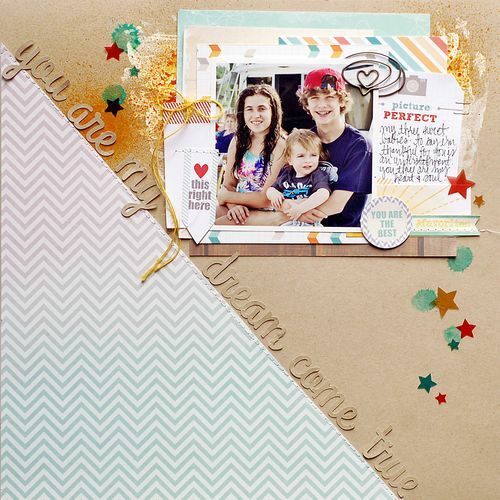 Scraps make for lovely rainbow color parties. 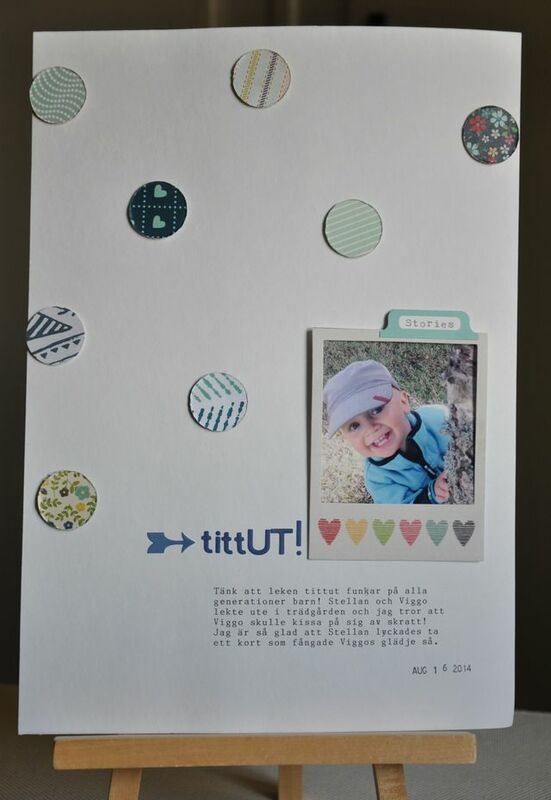 Color coding your scraps helps to make it easier to find fun combinations! 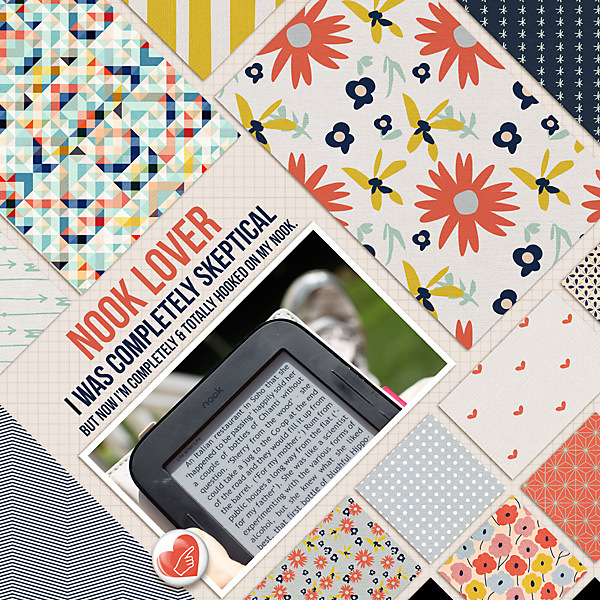 Thinking of your digital papers as regular papers can help you think of innovative ways to use them!! 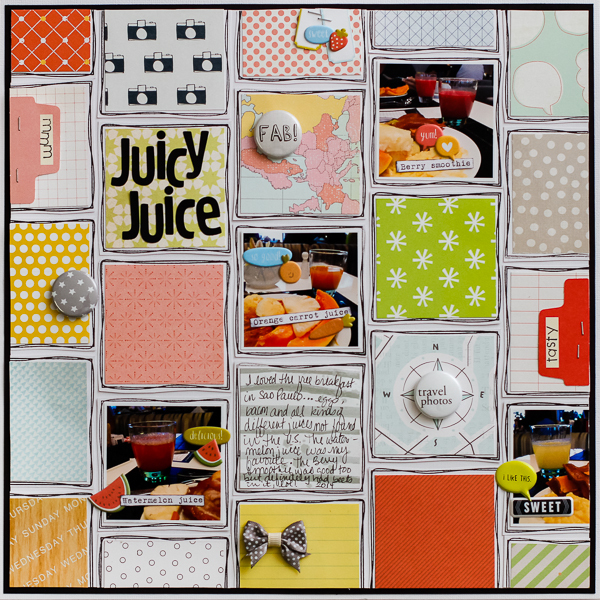 Valerie used a punch to create a quilted background. It was a lovely embellishment and took up the tiniest bit of leftovers. Awesome. 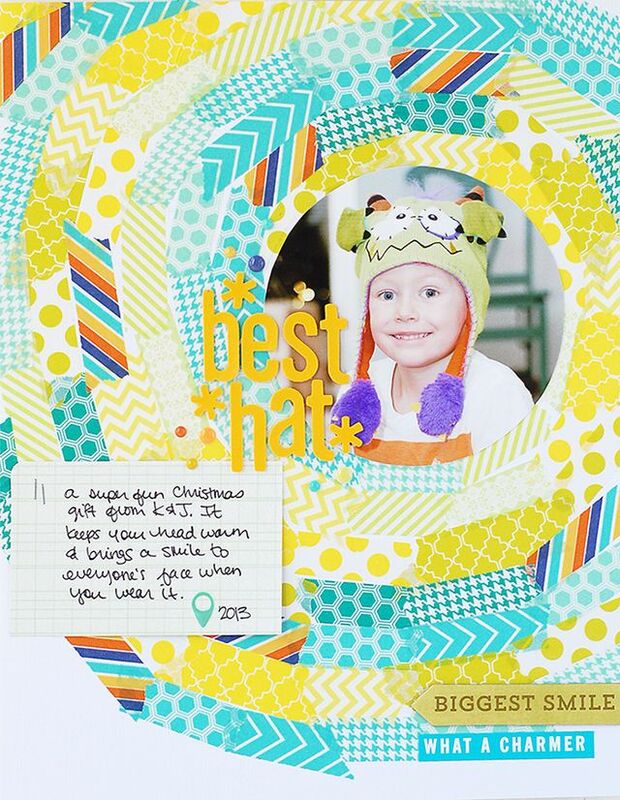 Adding a little bit of color to the center of the white paper circles provides the perfect pop of color. Jennifer trimed her scraps to the same size as the photos, but meanwhile created a magnificent pumpkin. 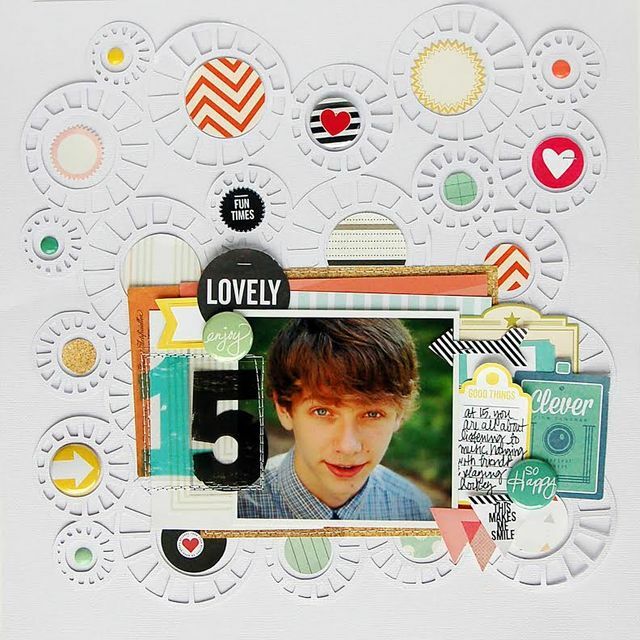 Such a creative use of squares and scraps. 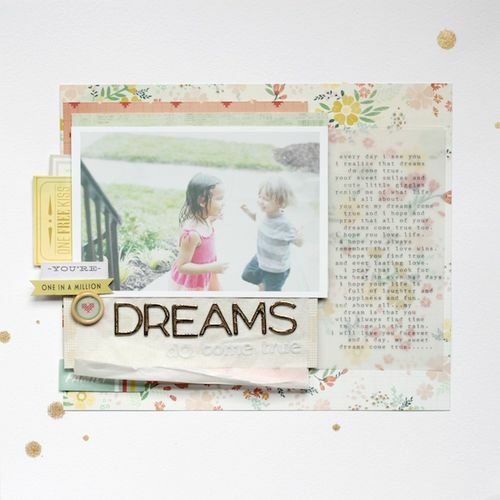 Little scraps of paper make for perfect journaling strips. And photo mattes. 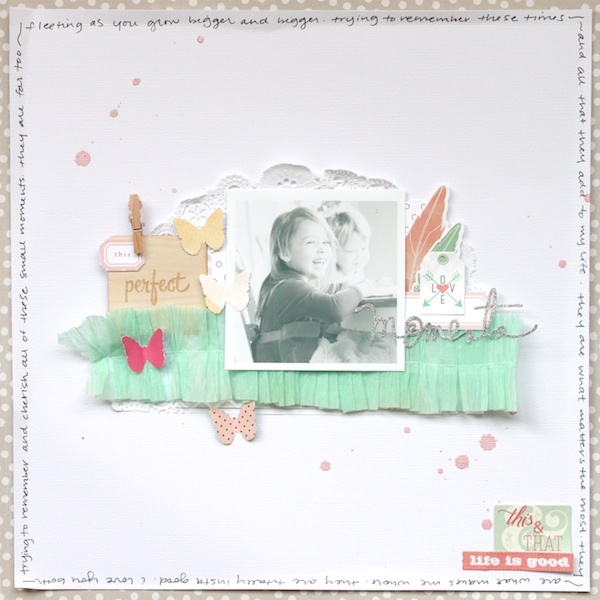 Scraps don't need to be used only in regularly sized pieces. Odd shapes make for interesting additions as well! 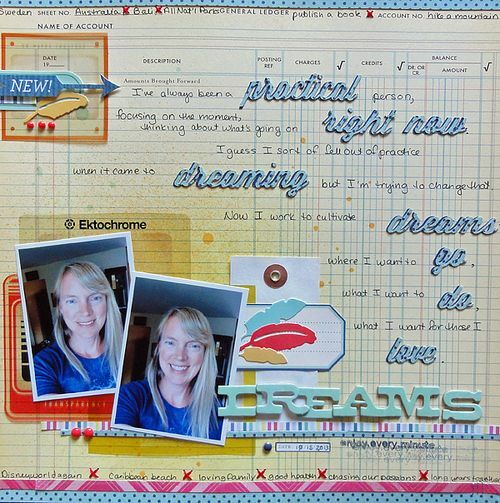 Let's start with finding some journaling ideas! Now let's move onto some photography ideas! 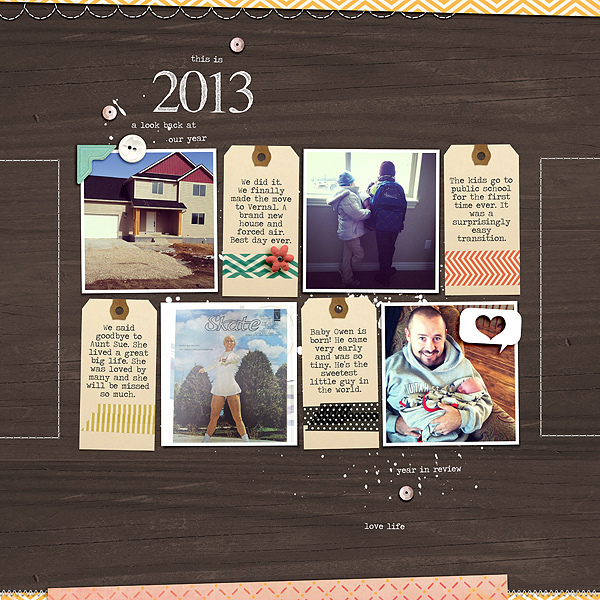 And lastly, some ideas for making well designed pages. 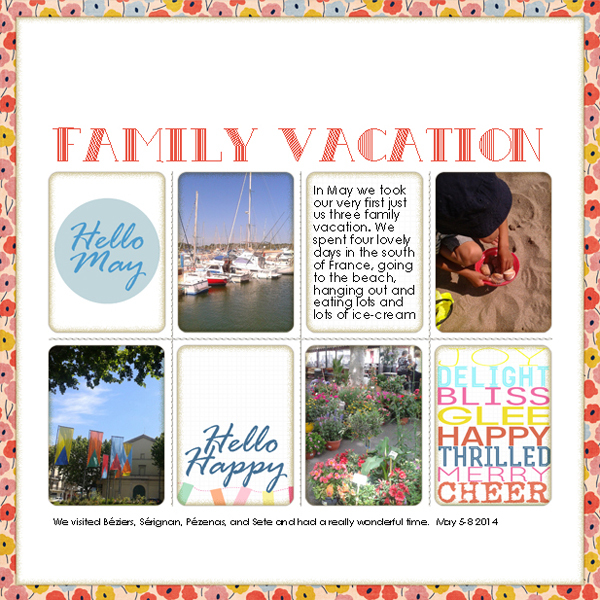 We hope you have enjoyed the month, both the gallery and the posts! Only four more days until our new gallery!! Not only was our topic this month The Best, but it also had some of the best ideas. 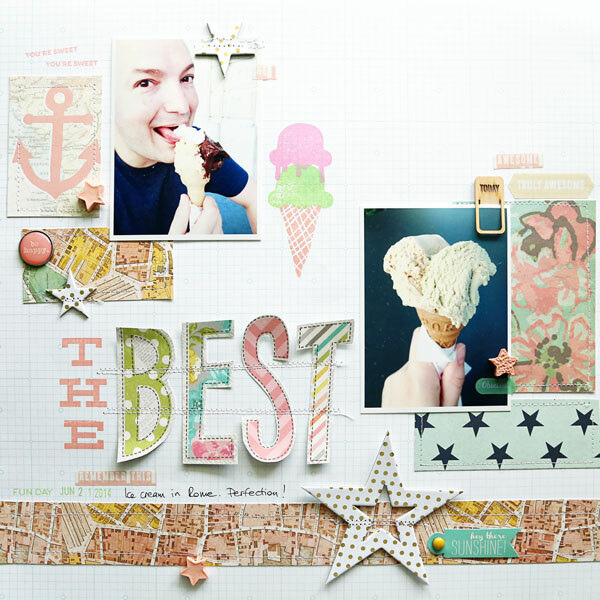 Let's pick out a few of the best ideas for making the best layouts ever! Try seeing how much journaling you can capture when you WRITE a clever title. Titles are for focus and for definition. They can really help you tell your readers where your story is headed. The next time you head out to your favorite restaurant, follow Jenny's lead and CLICK a quick pic of the menu. It will be something that changes from time to time, and it is fun to have a memory marker. Lisa followed some lovely lines of symmetry as she created her page. 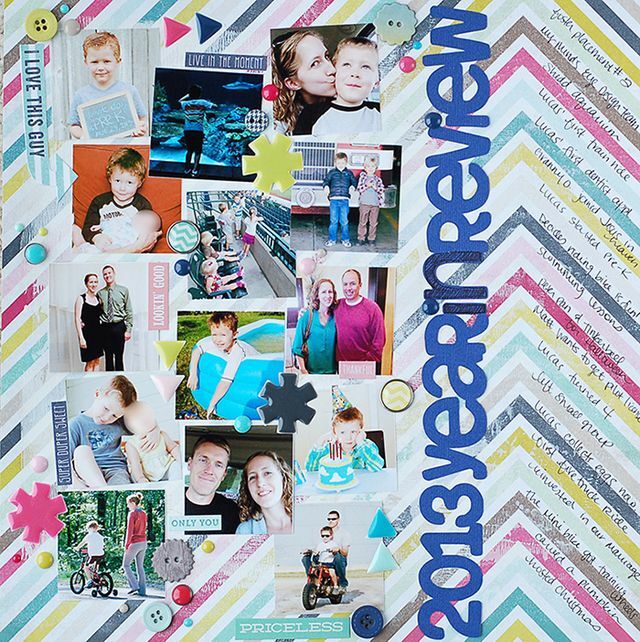 As you sit to SCRAPBOOK your next page, find ways to build mirrored halves from top to bottom or left to right. 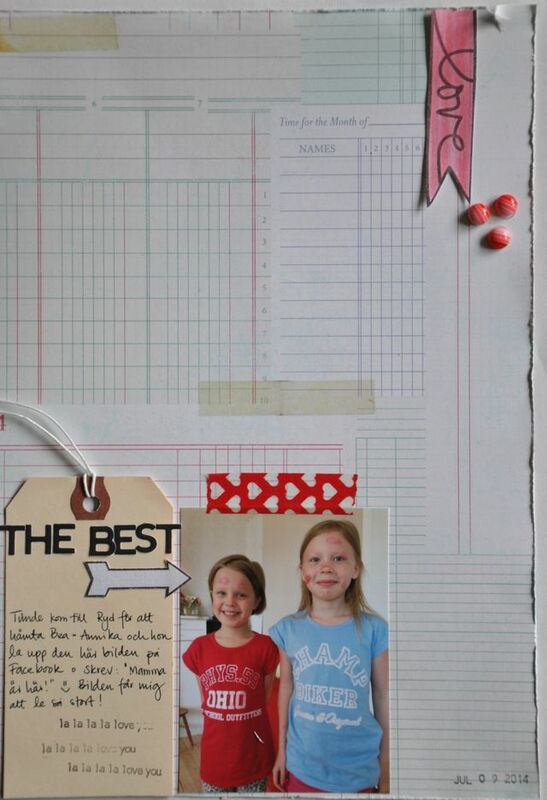 When is the last time you got out your brads to SCRAPBOOK? Be inspired by Sue and get them out and use them thoughtfully. 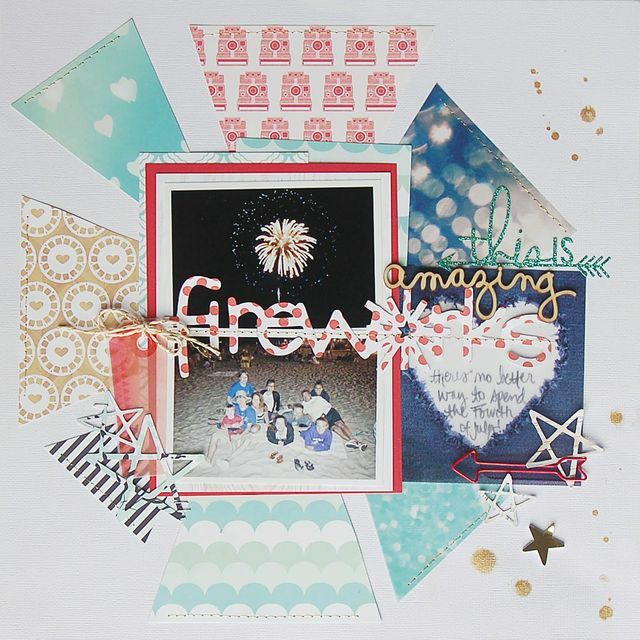 As you gather photos for your next SCRAPBOOK page, consider looking for a group that offers a variety of focal ranges: up close, wide view, and in between. 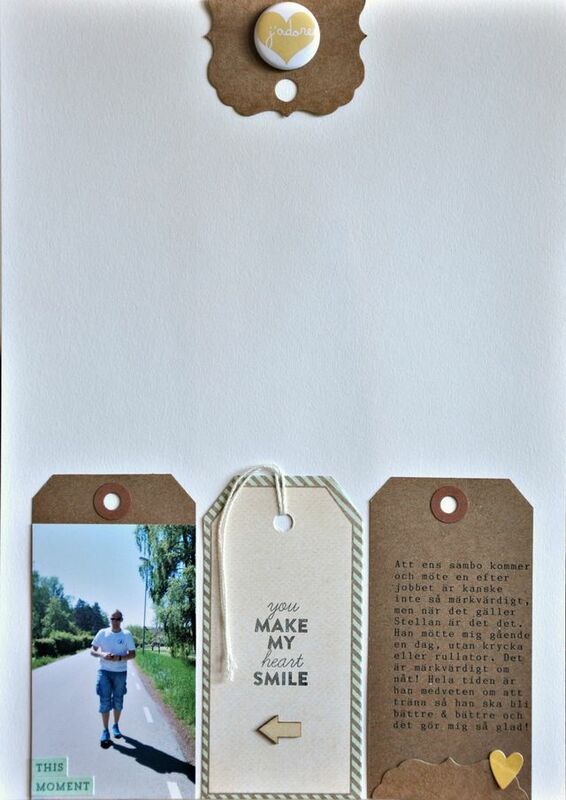 It's a small thing that will help collected photos feel more collected and less posed. We all take many photos of our pets, but when was the last time you handed your camera to someone and asked them to CLICK a pic of you and your furry friend together? 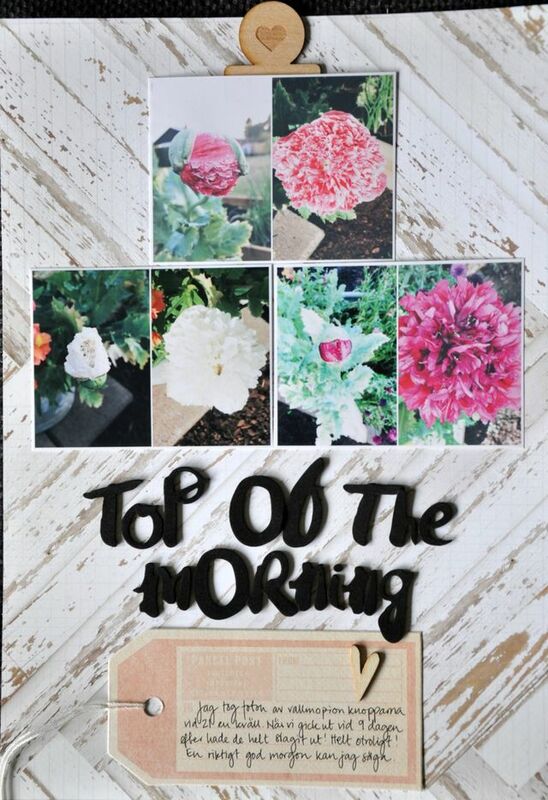 SCRAPBOOK titles have been a bit neglected over the past few years. Amy gave hers the sparkle it needed by swapping out the "o". Have fun with your titles and see what you can do to spruce your next one up. WRITE a love letter. In list form. It takes away a little of the pressure to get it all perfect. WRITE about something that is the best. Why is it the best? How is it the best? What makes it so special? The next time you CLICK that foodies shot, consider Cristina's pic here and look for a background that will allow your food to shine! When we WRITE about the books we read, we ofter say whether or not we loved it. But why not do what Celeste did and talk about why we even picked up the book to begin with? It's a great way to add context and depth to your story. Photos like this are what happy memories are made of. When you kids do that wacky stuff that makes you grin from ear to ear, don't forget to grab your camera and CLICK away. Oh me oh my! These photos are awesome! Last month we shot from behind and above. This month, try to CLICK from the side. Profiles are stories in an of themselves, providing depth and texture that a straight-on photo cannot. 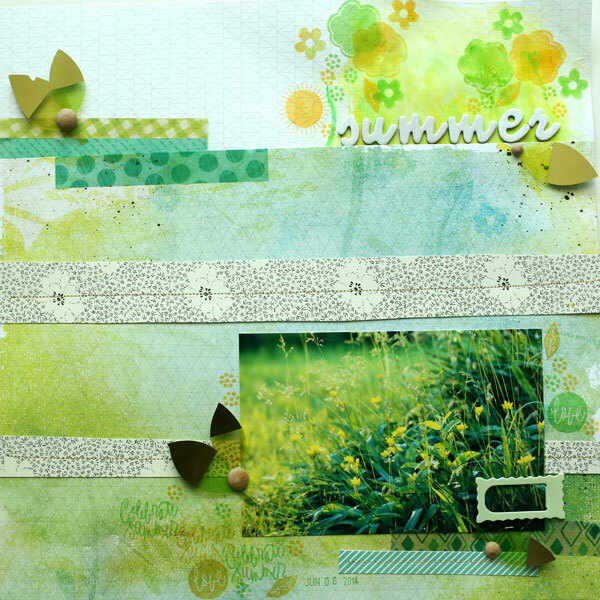 With summer drawing to a close, SCRAPBOOK a compilation page as Jennifer has. Different photos from different days and places. All in one spot. Perfect for reminiscing. 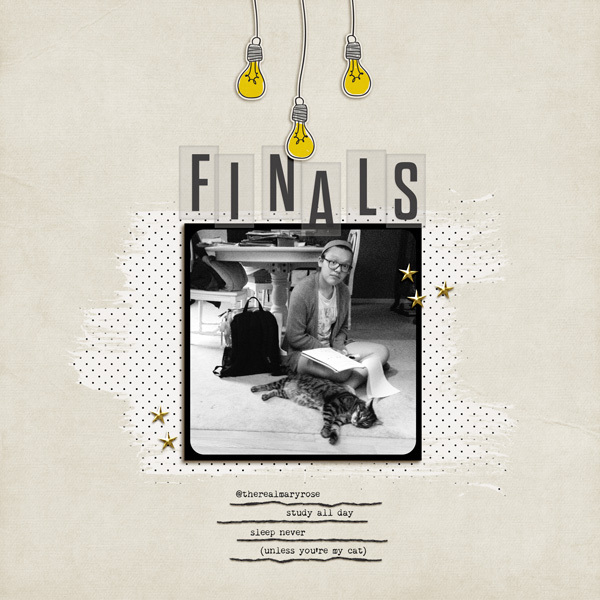 WRITE about a time where you found happiness despite the chaos that was surrounding you. We all have hard times, but yet, there are always little rays of sunshine that peek through the clouds. Writing about them helps us remember the good times, too. 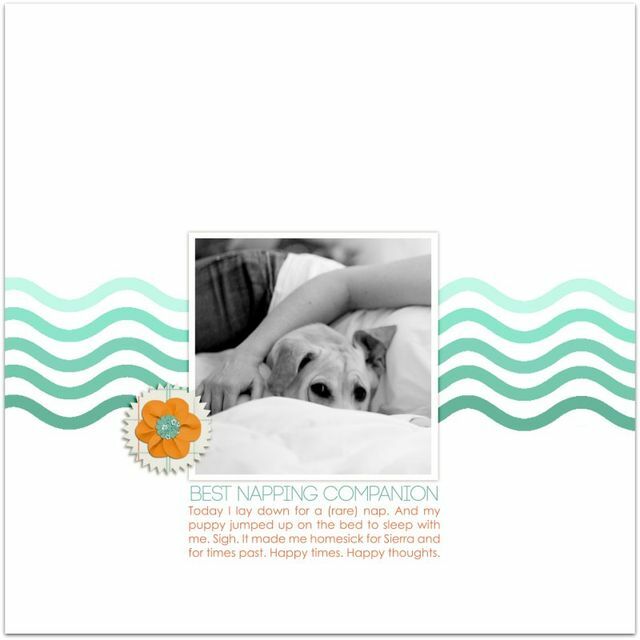 WRITE about the reasons your pet is a good/bad fit for your family. Or if you don't have a pet, write about ways you are like/not like your own family. Lisa used all sort of threes on her page. 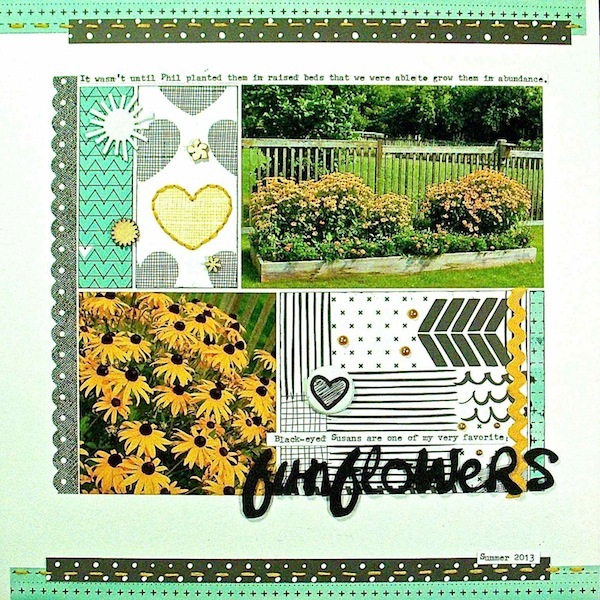 It is a lovely help to your SCRAPBOOK pages. Think of grouping in three's, repeating in three's and using three focal points. It will make your page balanced and peaceful. 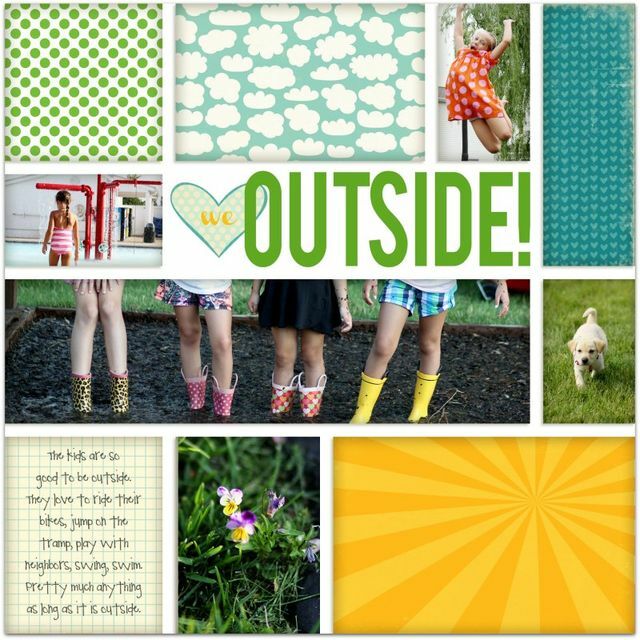 We really hoped you enjoyed our monthly gallery, The Great Outdoors. Did you have a favorite layout? Anything catch your eye? Before we move to our August gallery, let's take one last look at our July gallery. WRITE about that which makes you calm. Do you find your peace in the mountains? on the beach? in the urban jungle? The next time you are taking a photo of your garden, CLICK one photo of the whole, and then one macro. Then use them both on your layout. 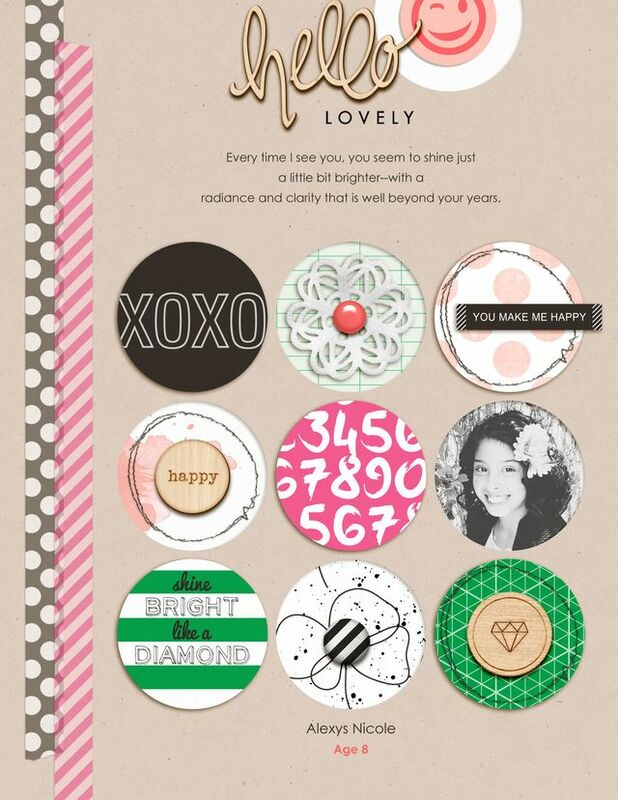 For your next page, choose an embellishment that furthers your story. For instance, Jenny used the geo marker. 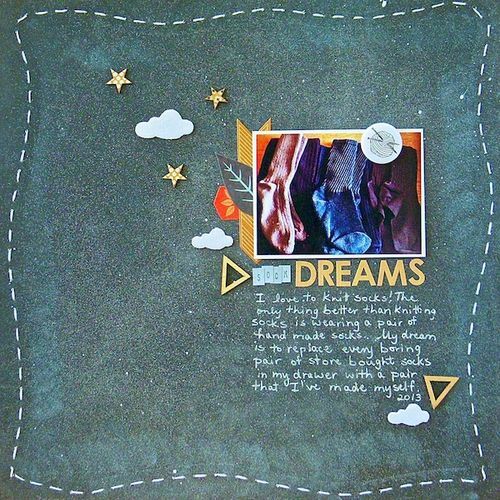 A well thought out SCRAPBOOK page is purposeful, too! Don't forget it is okay to CLICK your camera to capture the back of your subjects as well. It can add a lovely air of a stolen moment. Or rather than from behind, try to CLICK from above! Perspective adds such diversity to our photos. 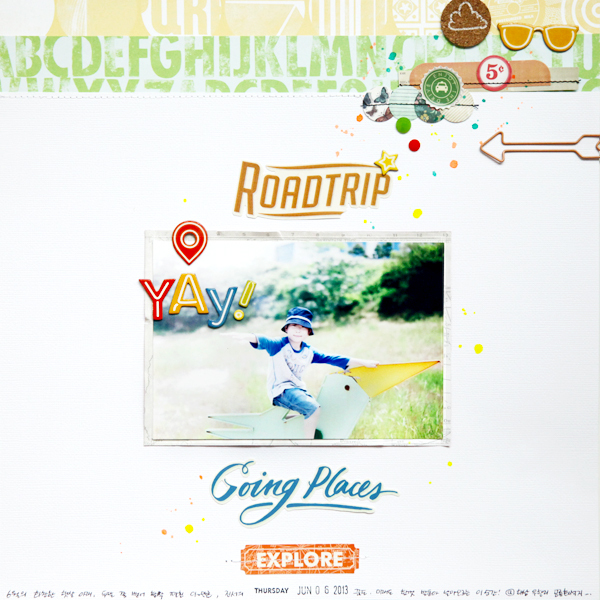 As you SCRAPBOOK, draw a color from your photo into the colors of the layout. 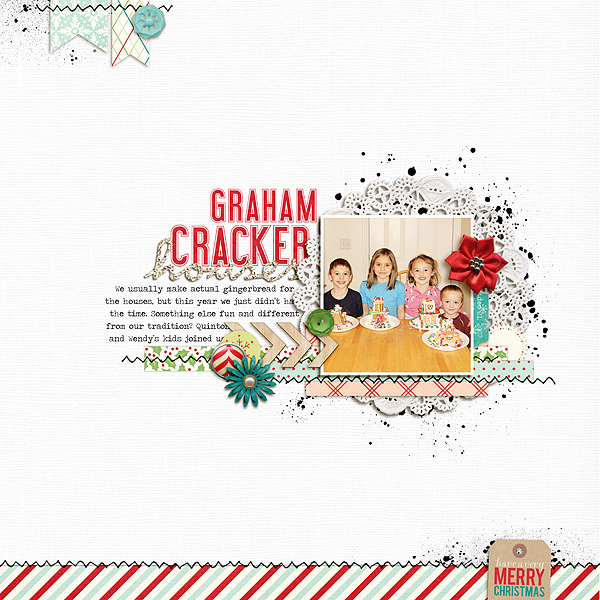 As you SCRAPBOOK, try using wordstrips and phrases to create a vertical column in the center, creating a strong focal point. As you are taking your flower photos, try AV mode. Set your aperture as low as it will go, focus on the center of a flower, then CLICK! 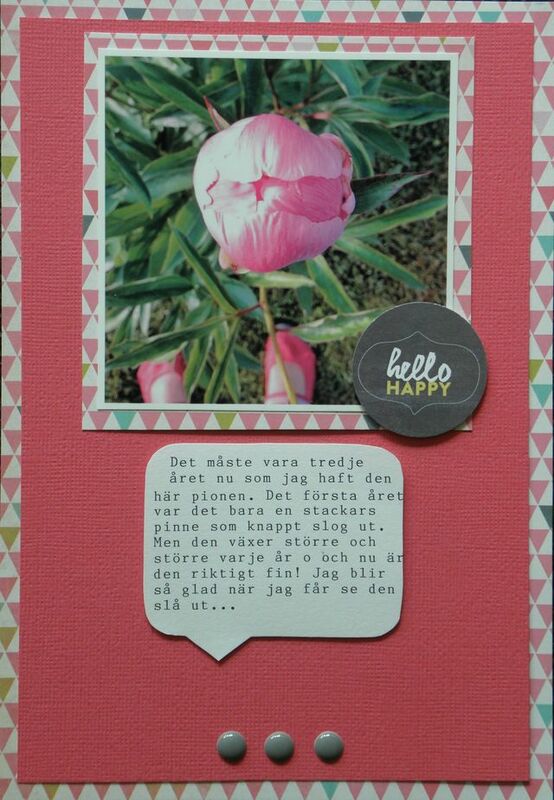 and enjoy the lovely sharp center and blurred edges. As you WRITE your next journaling block, don't forget to include the emotion behind what was going on. The "how did that make you feel" part is a terrific addition to any page. As you look to gather photos for a layout, remember they don't all have to come from the same day. You can gather them around a theme, or a season, or any other common thread. CLICK through your folders and pick to your heart's content. Right now the large photos are in! 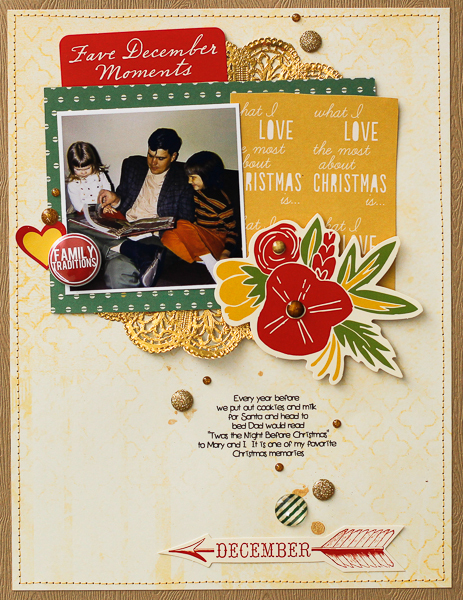 If there is a photo that you haven't scrapbooked as you didn't want to crop it, SCRAPBOOK it now in its large format glory. Te next time you go to SCRAPBOOK do not despair if you are missing a character in your thickers pile. Just be creative! Like Lisa with the hashtag. All is well and fixable! Grab your camera. Stand on your porch. Think of one thing that you LOVE in your community. Now run and take a picture of it. Hurry! Just one CLICK, though. Teasing. Take as many as you would like. 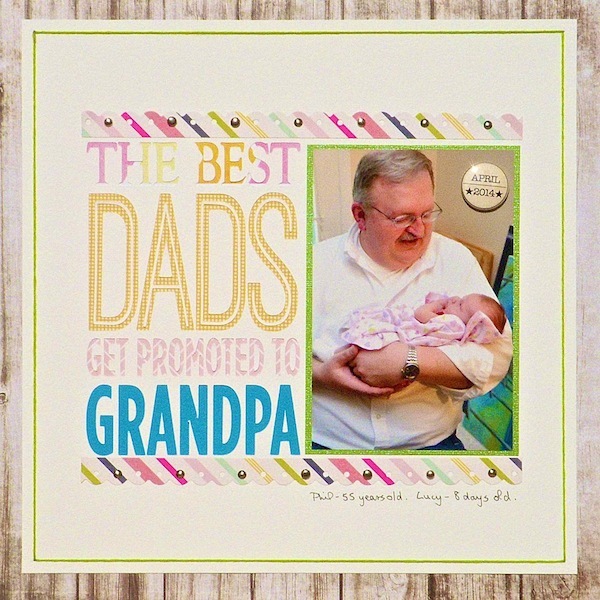 Then come home, print, and scrapbook it. 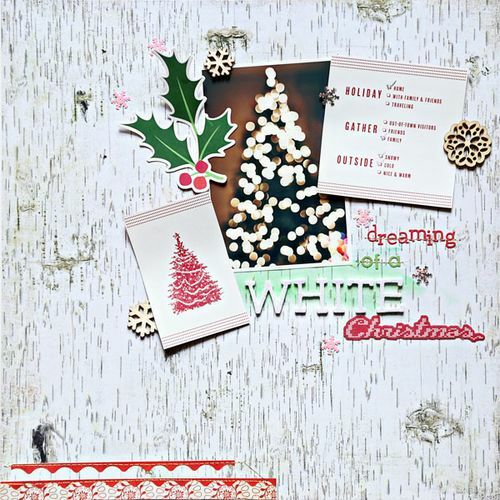 The next time you need trees on a SCRAPBOOK page, follow Valerie's lead and stitch a trunk and branches onto a brown triangle. Whodathunkit? It completely looks like a printed-on-the-paper element. Amazing. Try this for a journaling prompt: This is exactly what ___ looks like. Think for 1 minute and then WRITE away. 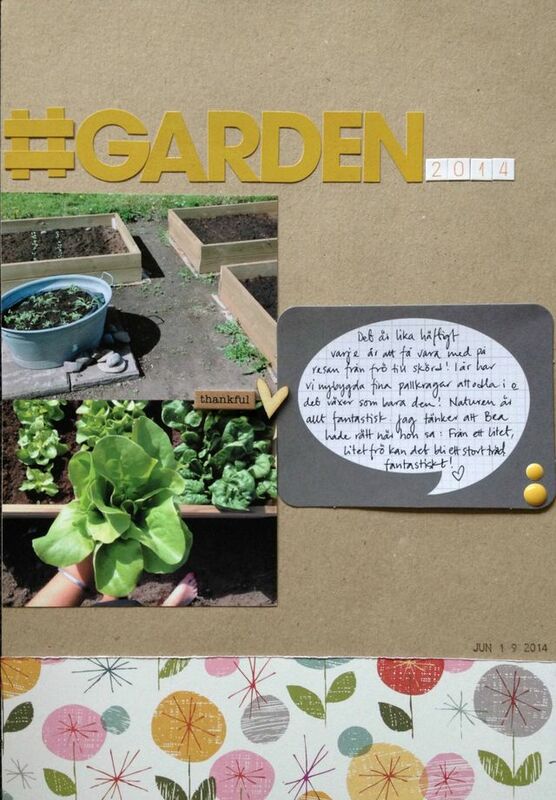 Perhaps you could WRITE a little about the things that you love in your backyard. Your immediate yard, or your community. Either will do. Have you recorded the relationship between your children's cousins or between you and your cousins? It can be reflective, or current. Or both. The important part is to WRITE about it. That's it! So many ideas. 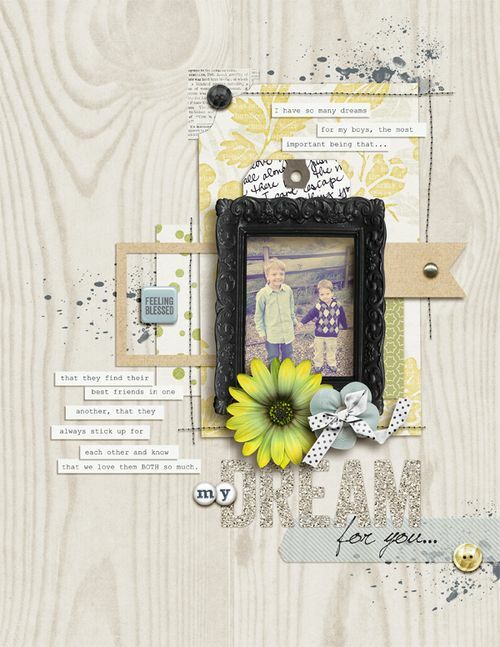 We hope you will feel inspired to create your own layouts! 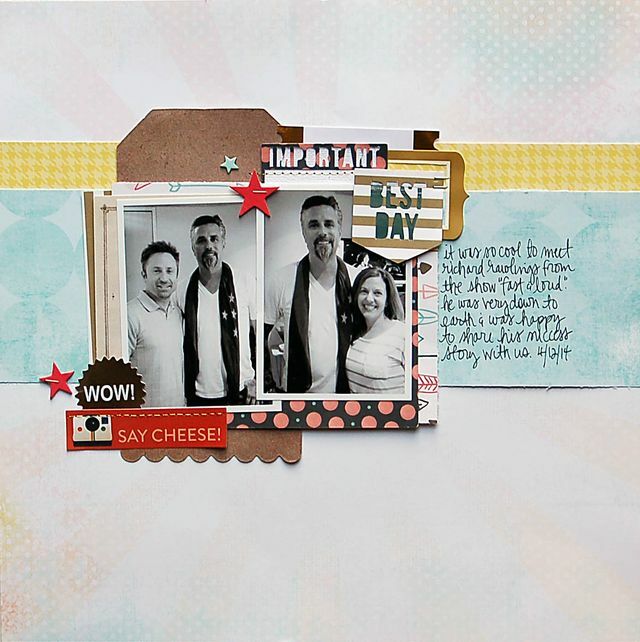 Our June gallery is such a treat as we get to see not only new layouts, but also their evolution. As we look through the layouts one last time, let's think of one thing that we could do based upon each layout. One way in which we could be inspired by the inspired. 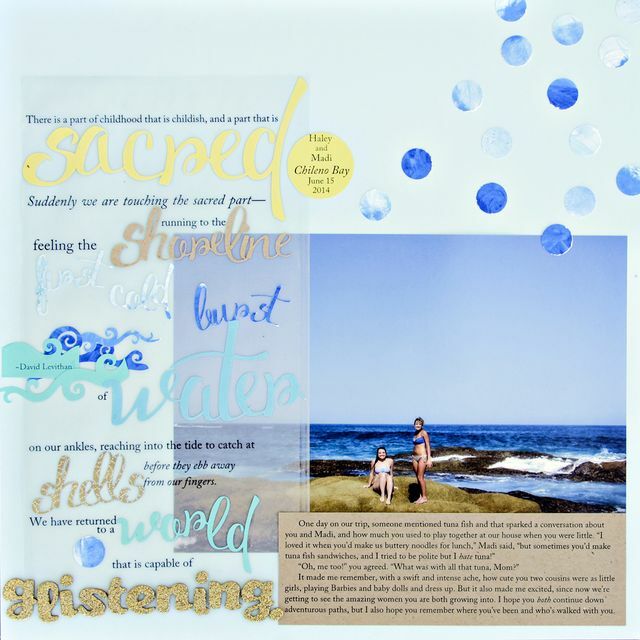 WRITE about how your children belong in their environment. Good fit? Square peg, round hole? Or how about you. Were you born into your environmental element, or did you have to find it as an adult? CLICK your camera at a subject lying down. Stand over top for a fun perspective. 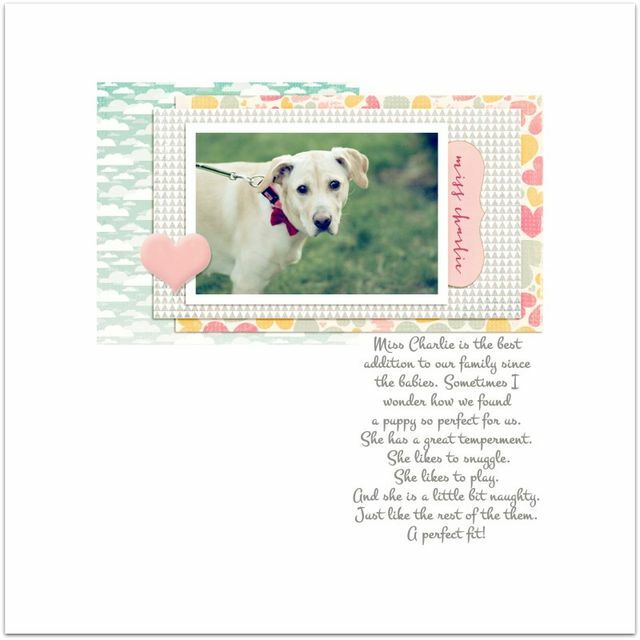 SCRAPBOOK using a theme of your page as an element. 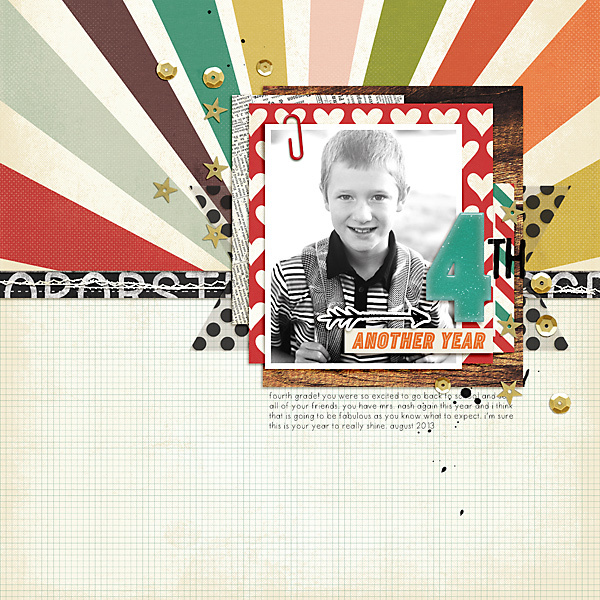 SCRAPBOOK using a tone on tone silhouette full page graphic. 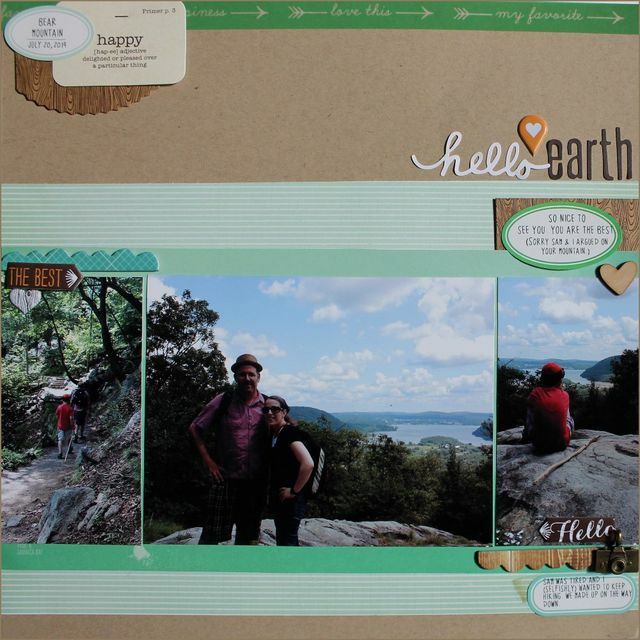 SCRAPBOOK with a bottom heavy design. WRITE about the end of an era. WRITE about a time when a dream came true. WRITE about one topic from multiple perspectives. 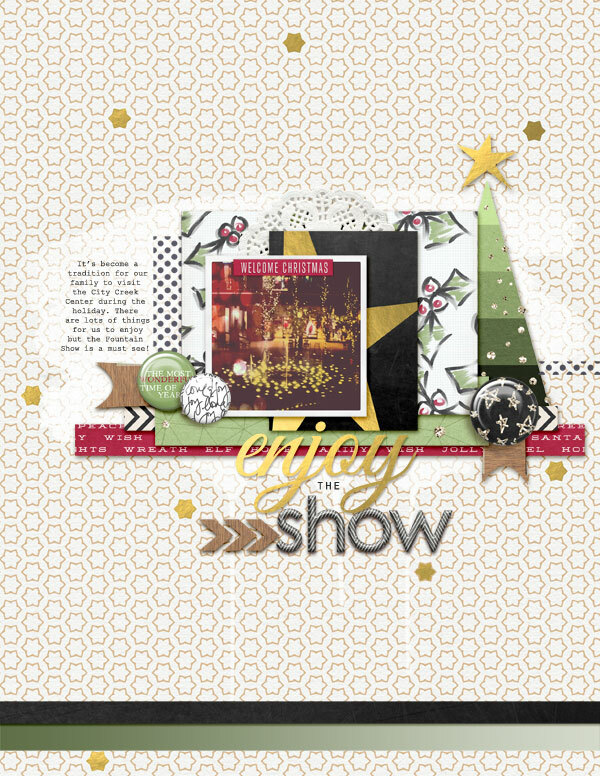 SCRAPBOOK with layers. At least four! CLICK a picture of your child in their natural element. 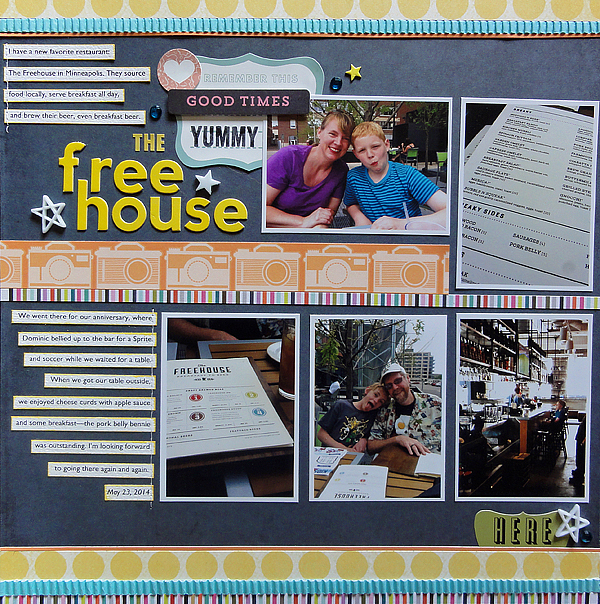 CLICK a photo of the menu board at your favorite restaurant. 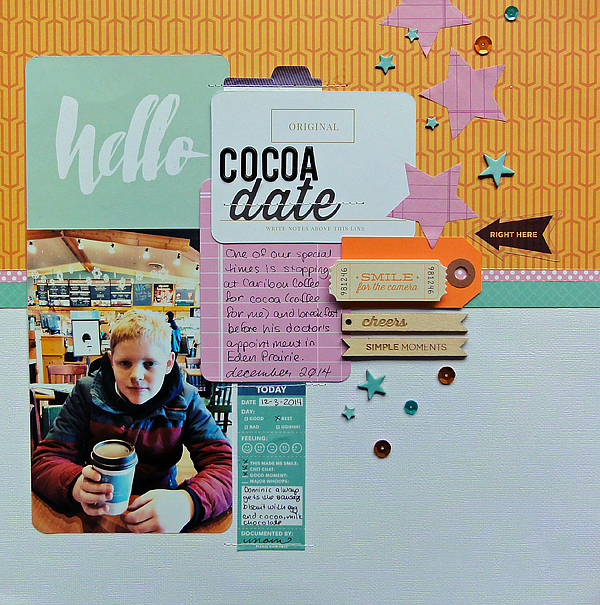 SCRAPBOOK using modeling paste. It's fun to get dirty! 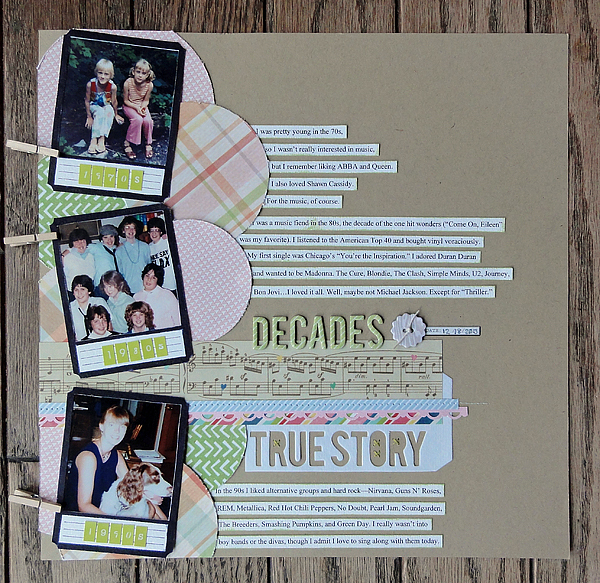 SCRAPBOOK using a color scheme from your favorite decade. 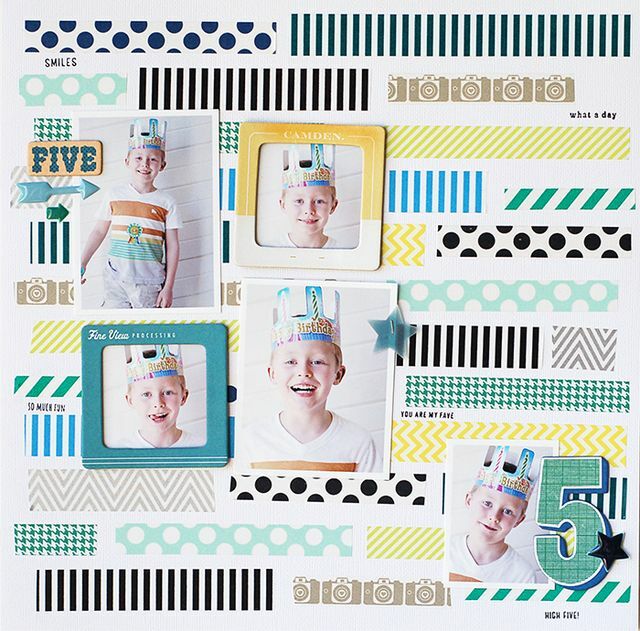 SCRAPBOOK with washi tape AND a number. It's a twofer challenge! 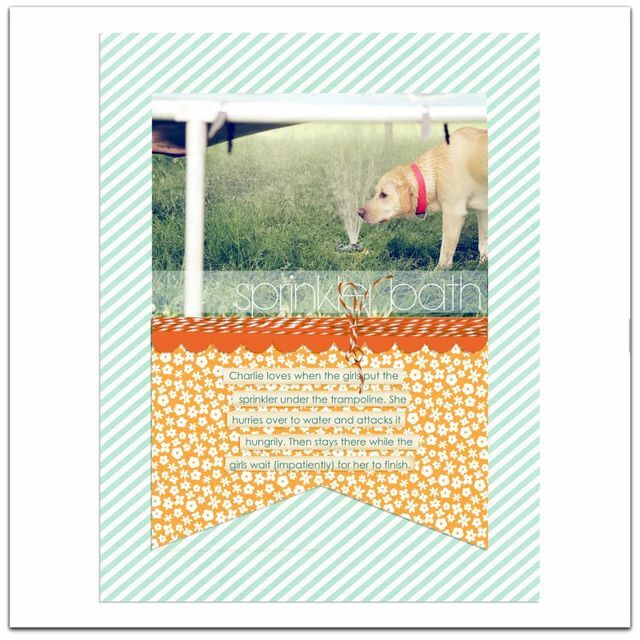 CLICK a photo of your pet doing something seasonal. Thank you for the increased number of comments! It is so lovely to hear from you and to better develop our relationships. It's so fun to check as the day goes on and see that our hard work is appreciated! Thank you so much. Before we go, we wanted to take a minute to say goodbye and thank you to Two Peas In a Bucket. We read the sad news this week that they are closing up shop. And we are so sad. So very sad. For years they were an industry leader. 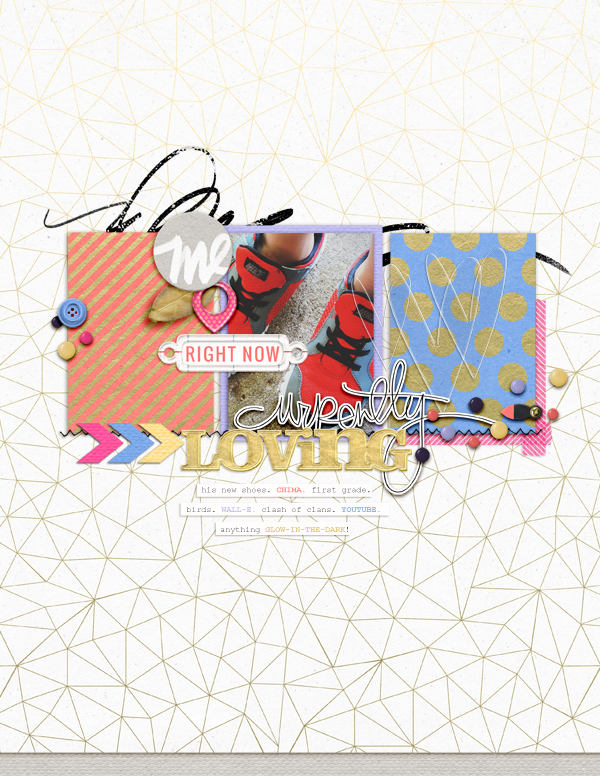 Ahead of their time, they created message boards that allowed us, as scrapbookers and people, to connect with one another. Their galleries allowed us all to improve as we could study and learn from those more talented. 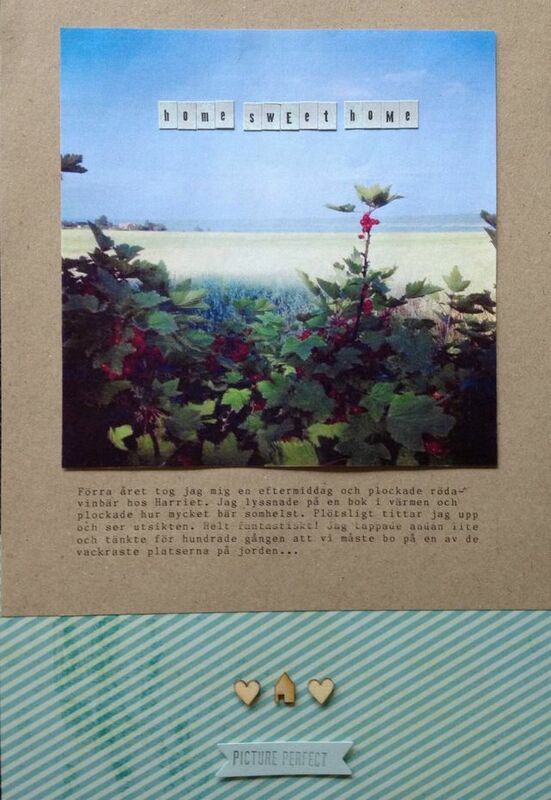 Their store helped launch companies as their Garden Girls showed what could be done with them. And their Garden Girls have been some of the most incredibly talented. 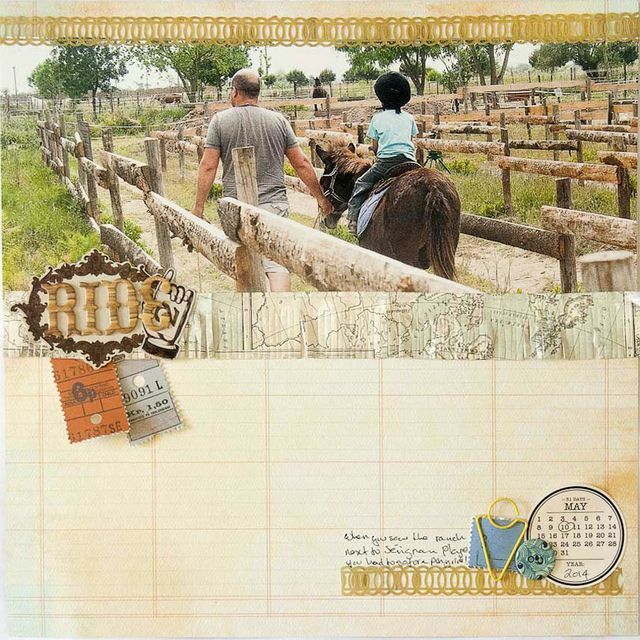 Kristina and Jeffrey had vision and talent and used it to alter the face and the landscape of the scrapbooking world. 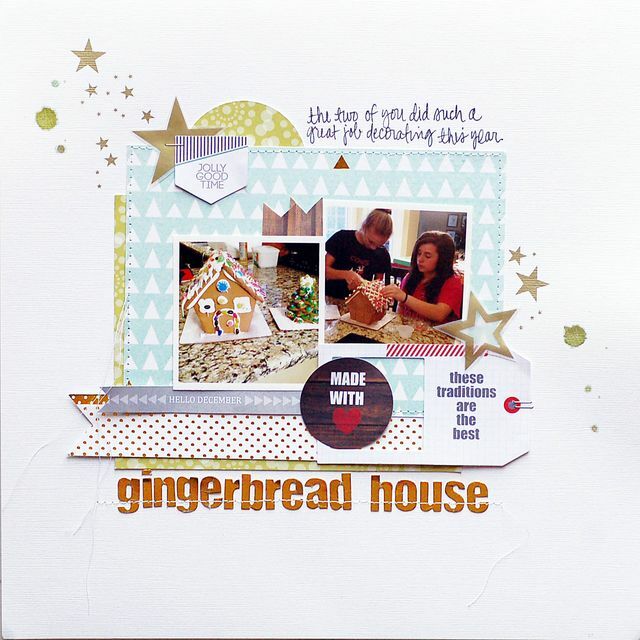 Thank you, to both of them for creating a community for us and for forging an online scrapbooking home for so very many of us. We will miss you! As January draws to a close, we are diving back into our January gallery, The Times, for one last chance to be wowed, and to be inspired to better our pages through journaling, photography, and design. Please, won't you join us? 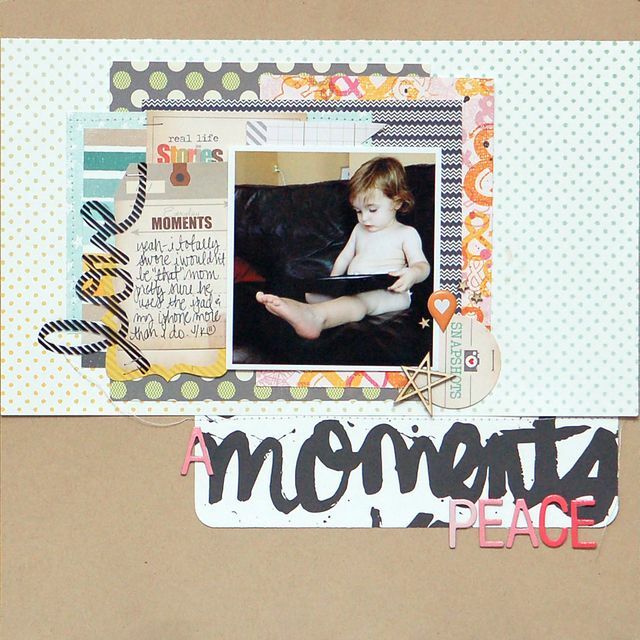 Journaling prompts are often the fastest start to a layout. Nothing like a good story to drive a page forward. 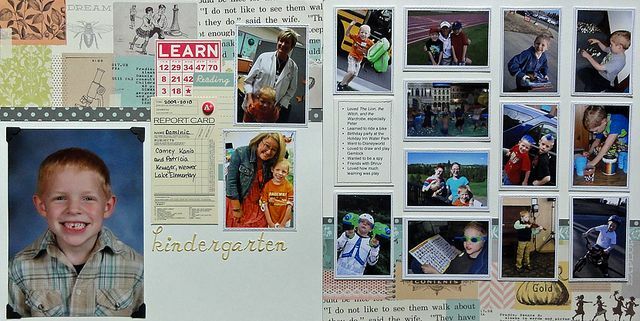 We thought these six layouts had terrific ideas for journaling. Do you ever think to yourself, "How did I get here?" As time goes by, we are still our same old selves but yet, the mirror shows someone else. Take a moment to journal about the growing up/old and how it makes you feel. Our language is constantly evolving. Pages like these are fun to look back on, as we tend to forget what was current as time eeks by. Might we suggest you enlist the aid of the teenagers in your homes? They are great at knowing all the hip slang. 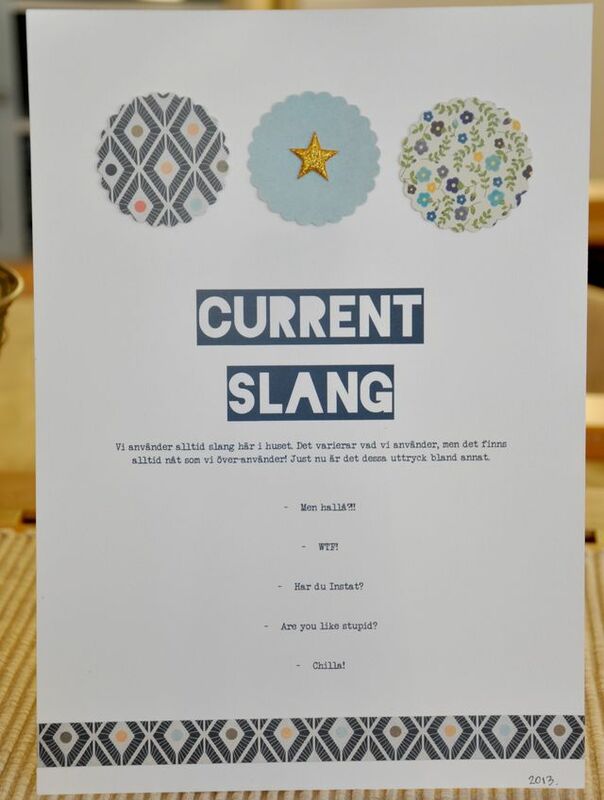 Though chances are they won't call it "hip slang!" Lists like this are easier than ever with the help of google. No longer do we need to rely upon our memories! This time of year, though, several news sites have lists compiled from which you can pick and choose headlines that matter to you. 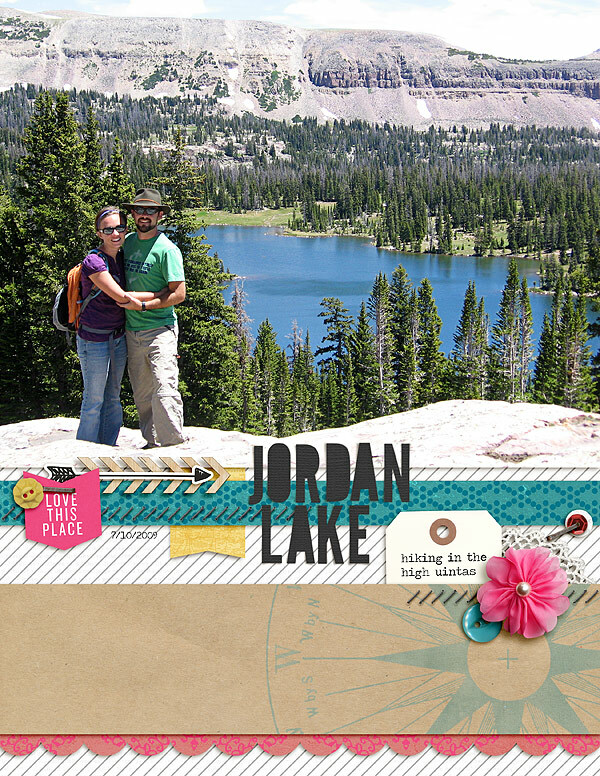 Some of our teams most favorite layouts are those that document the here and now. 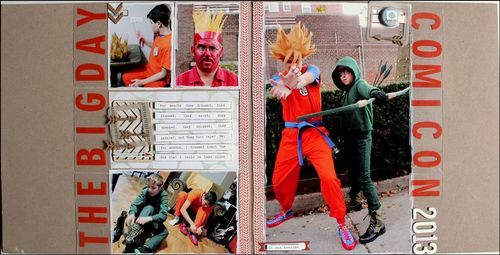 These are great pages for teens and selfies alike. Get out your timer. Set it for two minutes. Now take a moment to think back through your year. 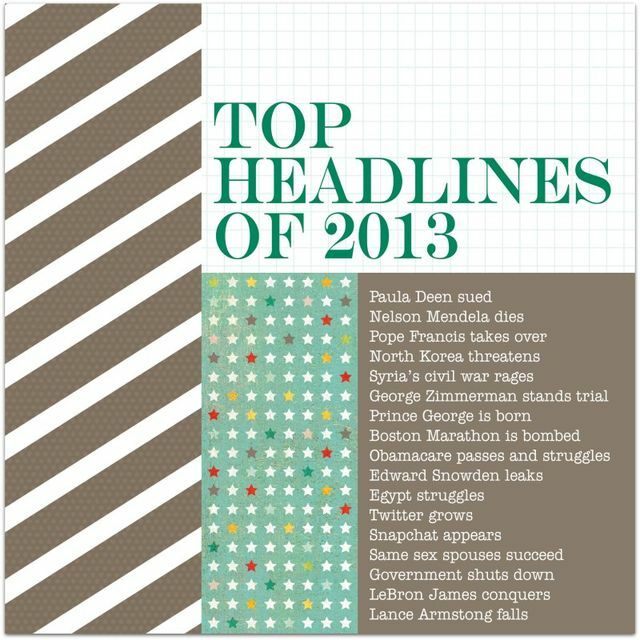 Make a list of 20 things you remember from 2013. Once your two minutes are up, get a new paper and start over. Sometimes it is tricky to get started, so the second list is helpful. 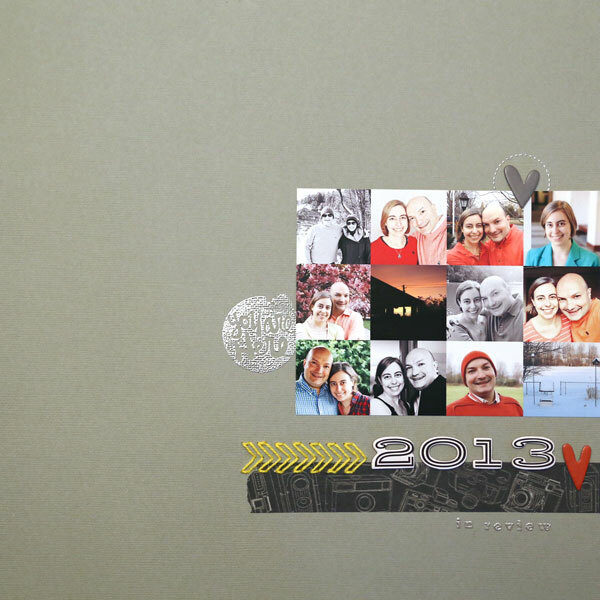 If you are stumped, spend some time with your 2013 photos and then make a list. 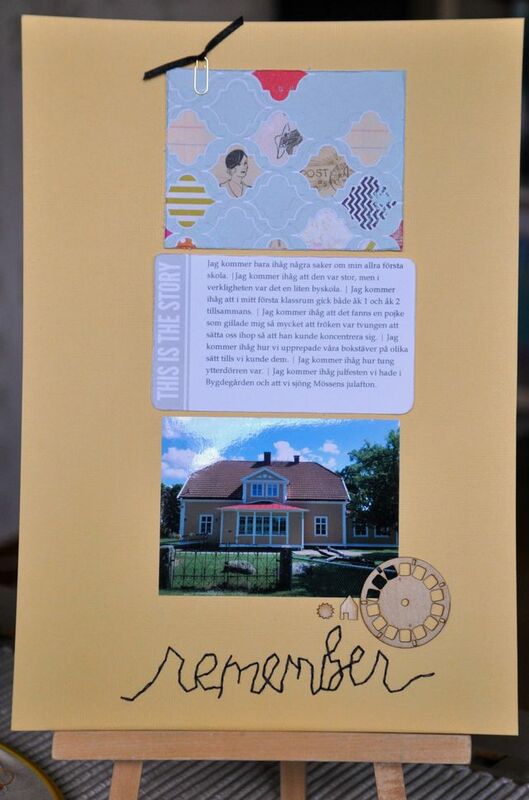 Or make a list of 12 things, coordinating with the months of the year. Or gather round the table as a family and make a list together! 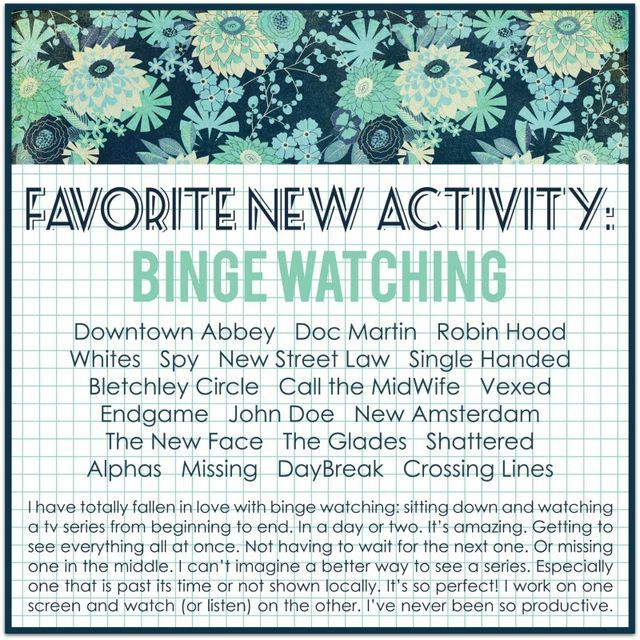 Have you changed the way to watch tv or listen to music lately? We have moved from tv to cable to dvr to netflix/hulu. These changes in technology, or how the changes affect you, are important to how we live our lives. Thus making it a terrific starting point for a layout! The gallery was filled with well shot photos but we felt like the photos on these layouts were additionally inspiring. When I think of screen shot I think of my computer screen. But Sue smartly took a shot of her tv screen to capture these images. Which gave the added bonus of a consistent black border in all her shots. 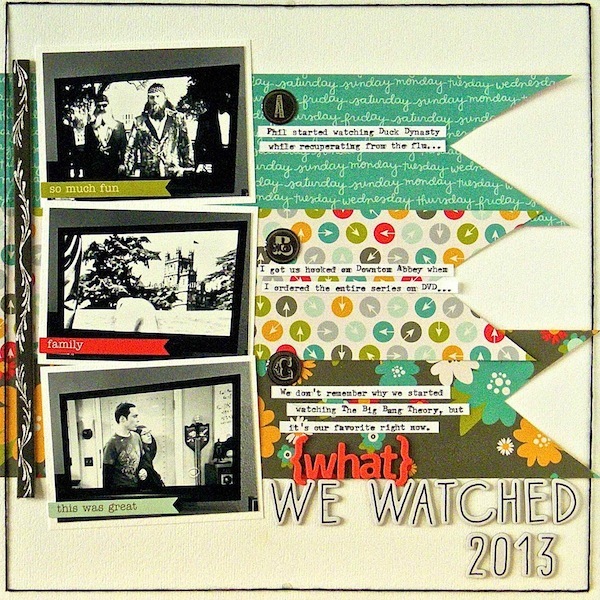 Such a smart way of getting the images you need to document your favorite shows. Pick three decades. Find a representative photo. Then start your layout! Easy as that! Food is a huge part of our lives. Either making it, eating it (or avoiding it!). Our phones are the perfect cameras for foodie photos. A design such as this will mask the limited quality and allow the subjects to shine. Cristina's layout is good to remind us that we need to get in our photos. With our beloved. Or without. But get in our photos!!! Here is another screen shot, not of the computer screen! This one is Francine's phone. Showing her favorite books. For all the reasons we love Pinterest with its visual lists, a shot like this truly is worth a thousand words! Siblings love one another so much. And then they grow up. They still love one another. But are afraid to show it. Or say it. Little kids loe having their photos taken. And then they grow up. They still want to have photos. But are afraid to ask. Or say that they love it. So growing up sibling photos are a double whammy of fun. So know it might not be well received. But also know, in the end, much appreciated. 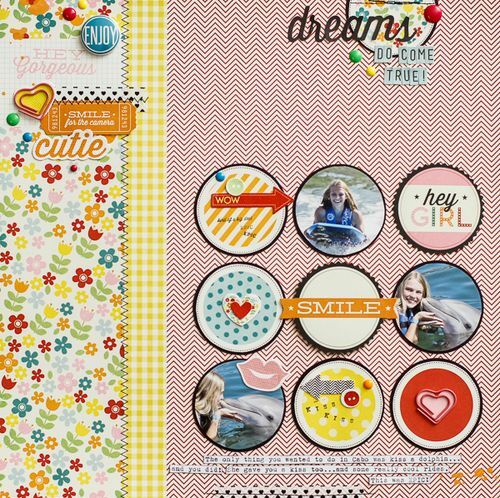 This month's gallery provided myriad templates to follow for layouts, but also included so many many ideas for making great pages. 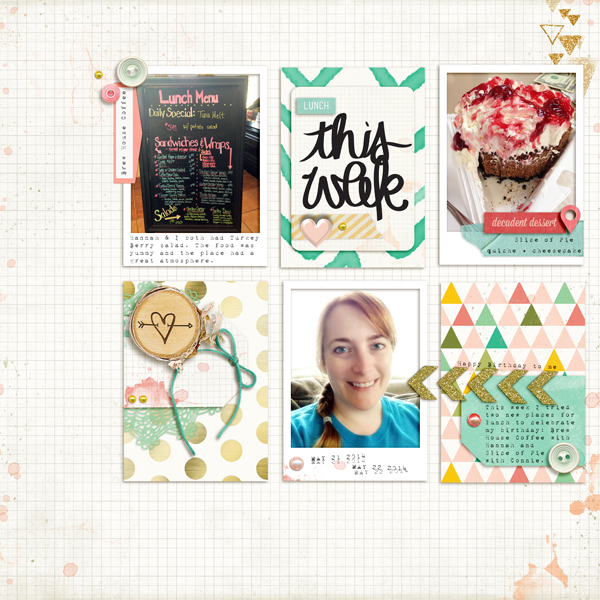 Here are a few layouts/ideas we wanted to highlight for you. 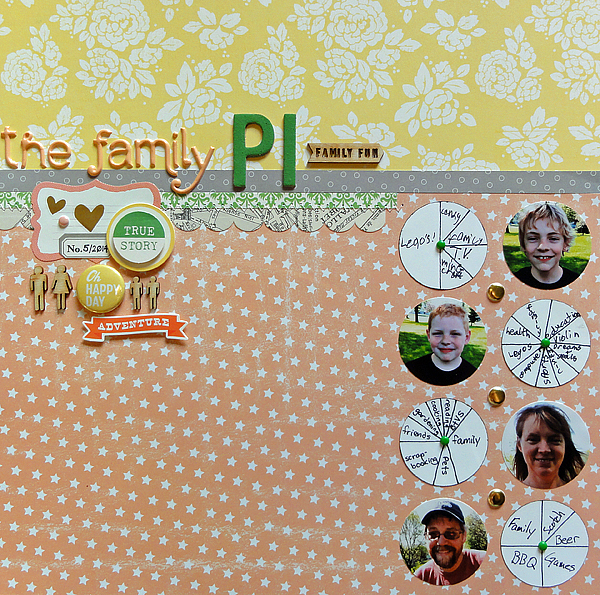 Celeste's layout is a study in the use of coordinating papers. Companies work hard to create lines with perfectly proportioned and balanced pattern scale. Then they select colors that work beautifully together. So let them do all the hard work. And then just sit back and enjoy the easiness of putting a layout together using a few or a plenty! Do you see Stephanie's stamp just above her title? See the three colors? 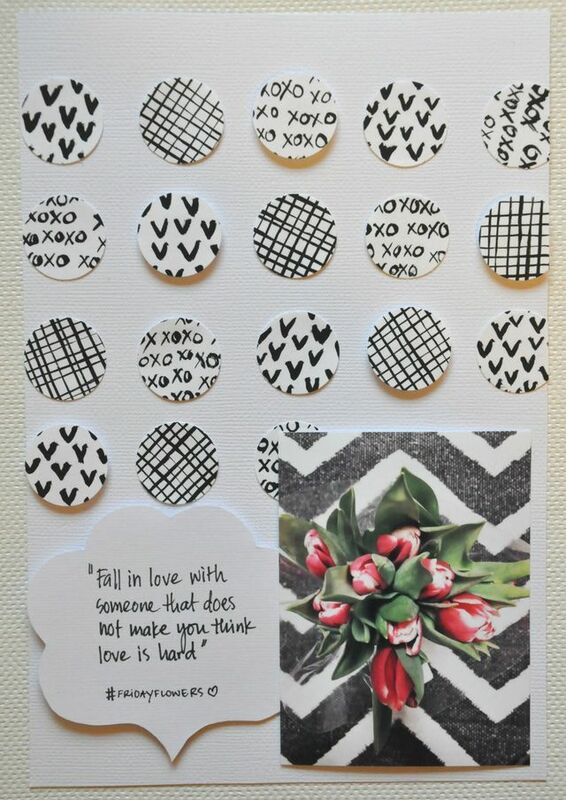 What a great way to use a stamp. 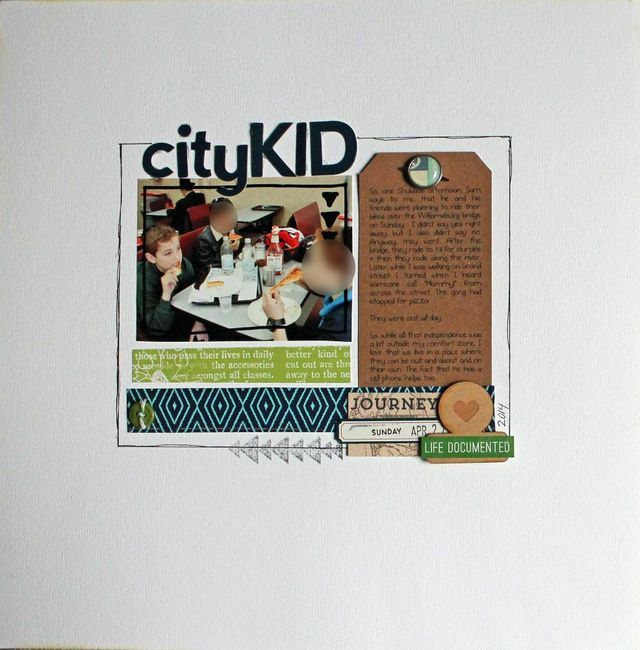 Paint the inks on with your pen and stamp a multicolored image. So much more fun to look at, no? Now and then. 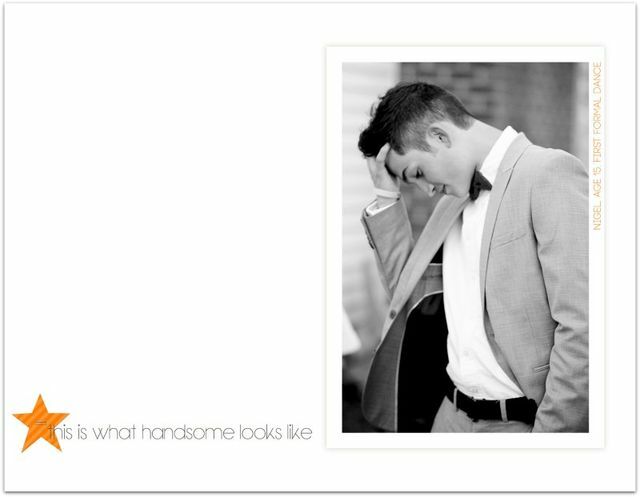 A fun idea for photo comparisons. Look at the similarities in Jina's photos. What a sweet thing to identify and then discuss. And it allows for a giant ampersand to be a part of the layout! A lovely layout in every way. See the doily? See how it's pink? A little mist here and a little mist there and you can change an embellishement to be jsut he color you need it to be! 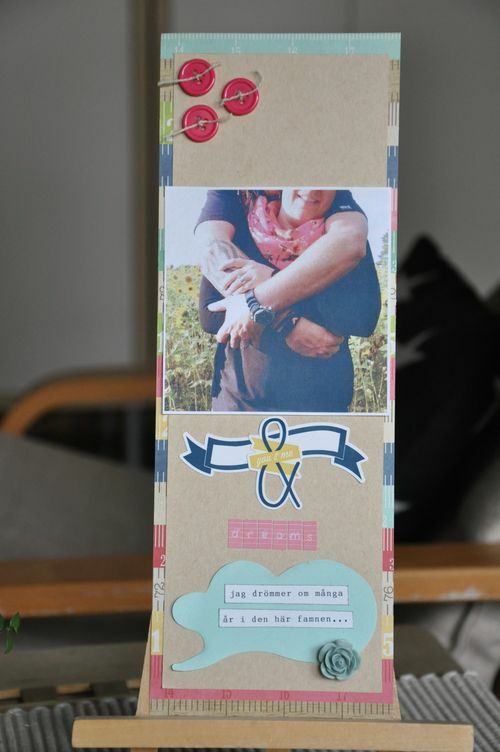 Tags and washi tape. Two little items that together make an embellishment with a big impact. 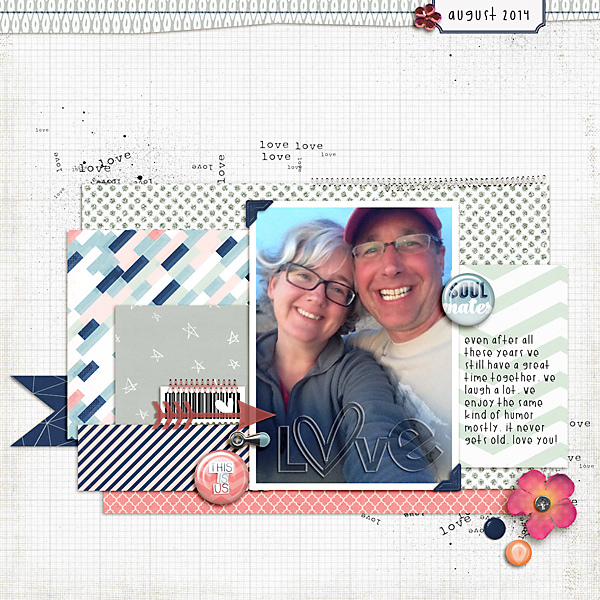 And allow for your journaling to take a place of prominence on your layout. So it doesn't get lost when it matters! 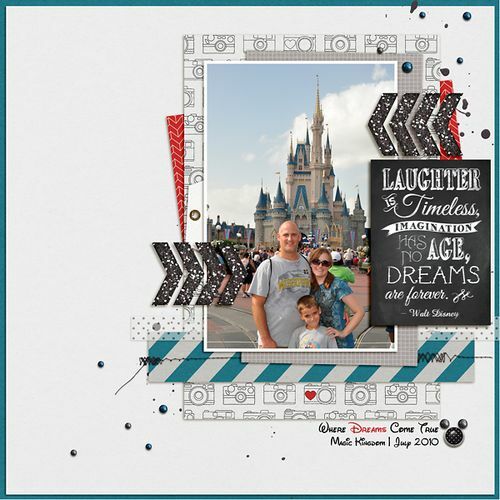 One of the bonuses of scrapbooking current photos is that trendy embellishments are available. Try to base a page around an iconic trendy element. Just like Diane's fox. Mmm good. That's it! We hope you enjoyed our gallery this month and we look forward to seeing you next Saturday for our brand new one! It is the final Saturday of the month which means we are here together for one last reflection upon and look into this month's gallery. 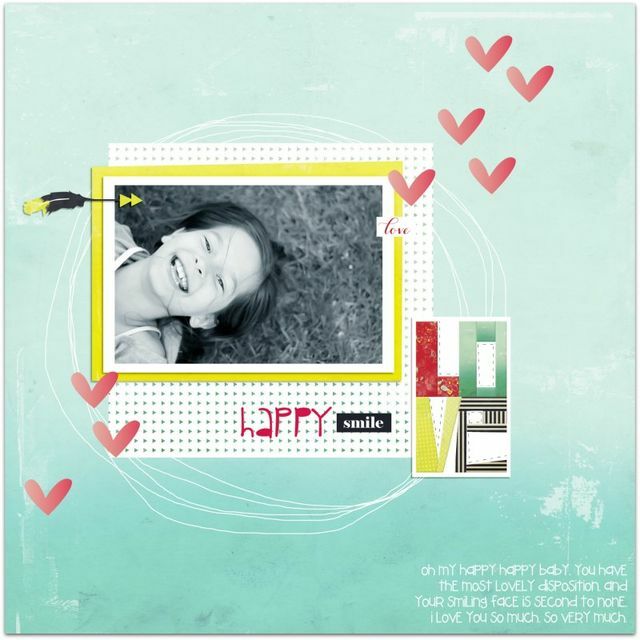 We hope you enjoyed our layouts and felt inspired to create your own lovely layouts. 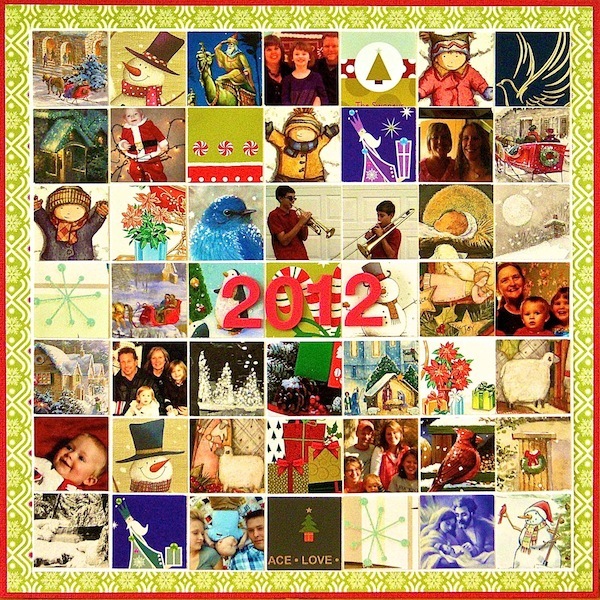 Here are a few suggestions for making the most of our December gallery, Holiday Traditions. 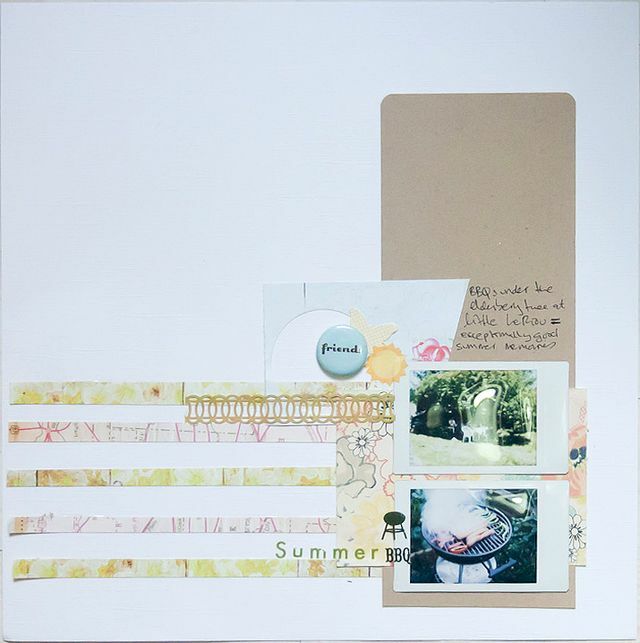 Here are six journaling ideas for you from our gallery. 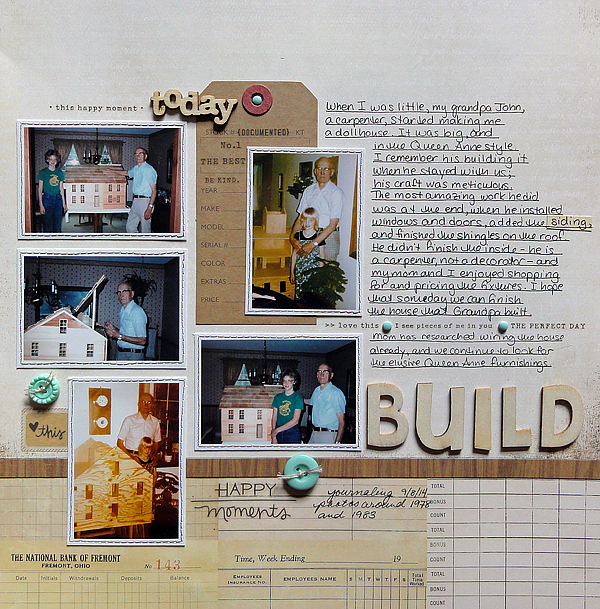 Make a layout detailing all that is involved with a family tradition. 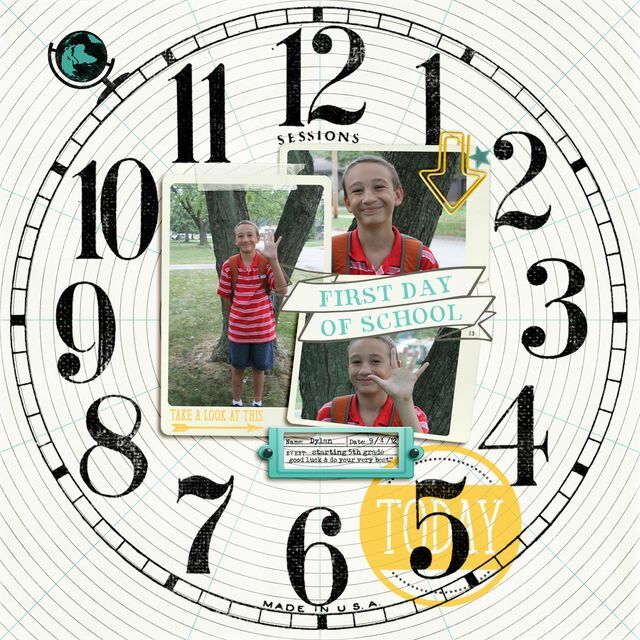 Record the changes in the lists of your kids. Include their take on what is happending as well. Did you have a change in a regular tradition this year? Record the change and the reason for it. Take time to explain your beliefs on a layout. And how those beliefs shape your holiday traditions. 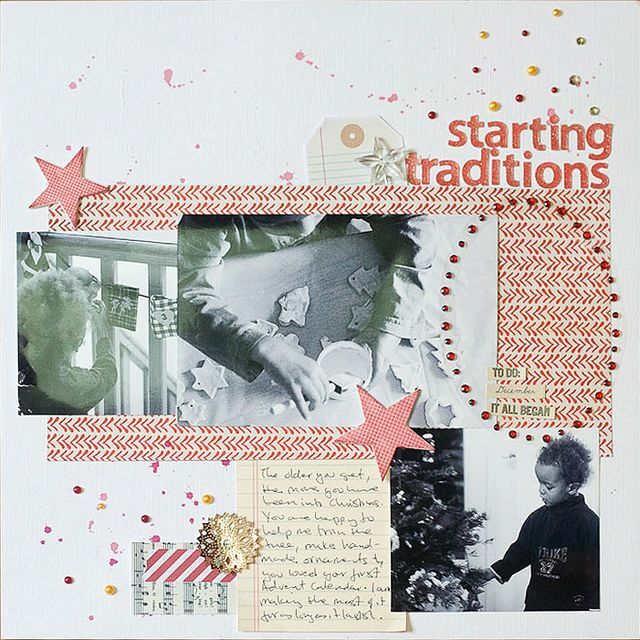 Record a childhood holiday memory. Don't be afraid to document a holiday "failure." 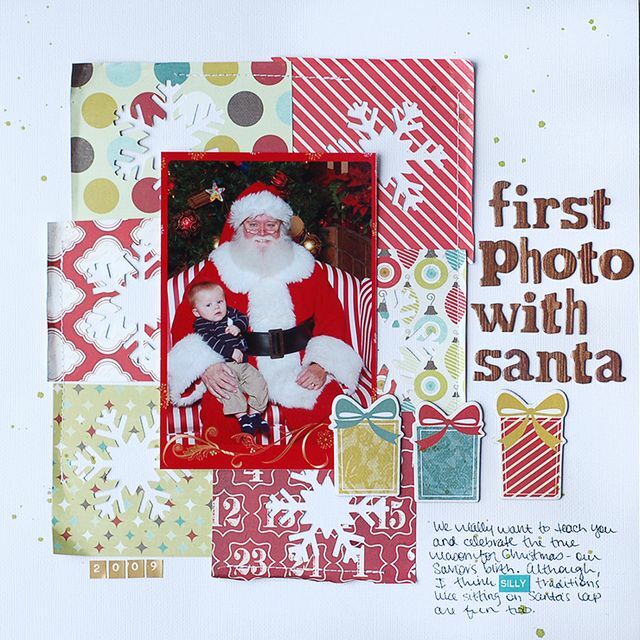 Here are six photography ideas from our Holiday Traditions gallery. 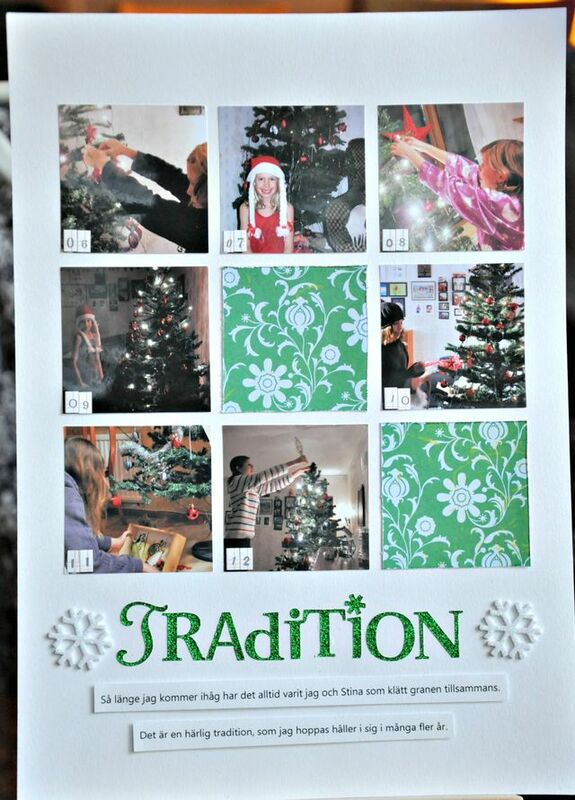 Try to get a shot of you or your kids mid-tradition. It's totally okay to pose this kid of shot, too! A full shot and a detail shot make a lovely pairing for recording a family tradition. Think of all the ways we use our hands to create during the holidays. Getting shots like Francine's preserve not just the traditions but the hands that make them. 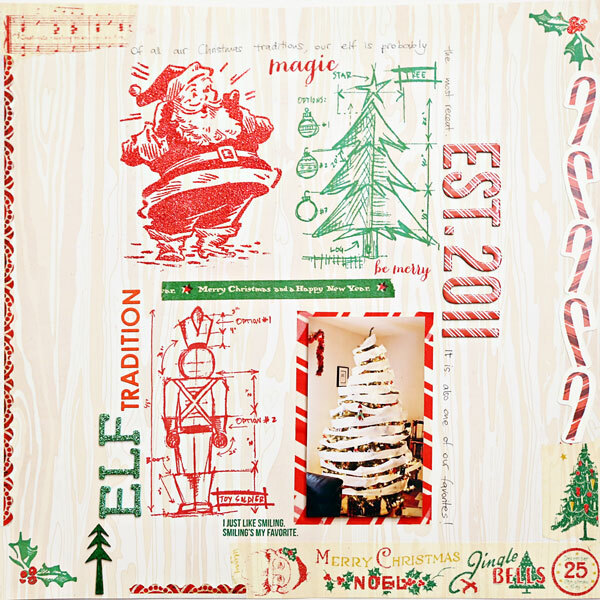 So many of us have an elf visitor--why not record each visit, or at least the stand outs? Don't forget the bokeh shot of your tree! Switch to your macro lens or setting and roam the house for a few detail shots that help document your holiday festivities. And finally, six ideas for designing your pages. 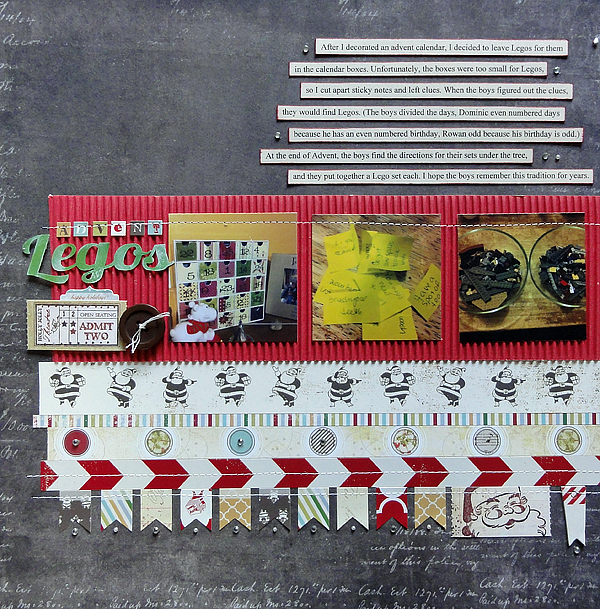 49 photos or card tidbits fit on one layout. Truly! Let's try it! Painting on patterned paper lightens the pattern allowing you to journal right on top of the paper. 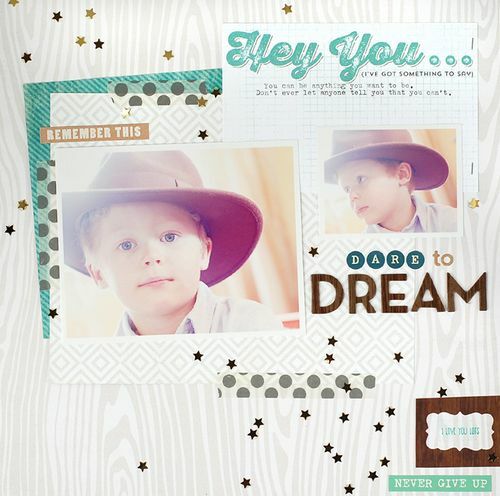 Try stitching over a stamped images. Yes, it's just for fun, not to hold anything down, but look how pretty! Ofttimes we try to coordinate two pagers bu making them look similar. Or do it Sam's way with similar design but dissimilar colors. So interesting! 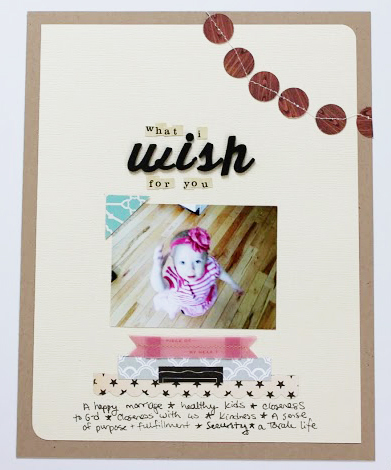 Use watercolors to add a pop of color and create a color scheme that coordinates with your embellishments. 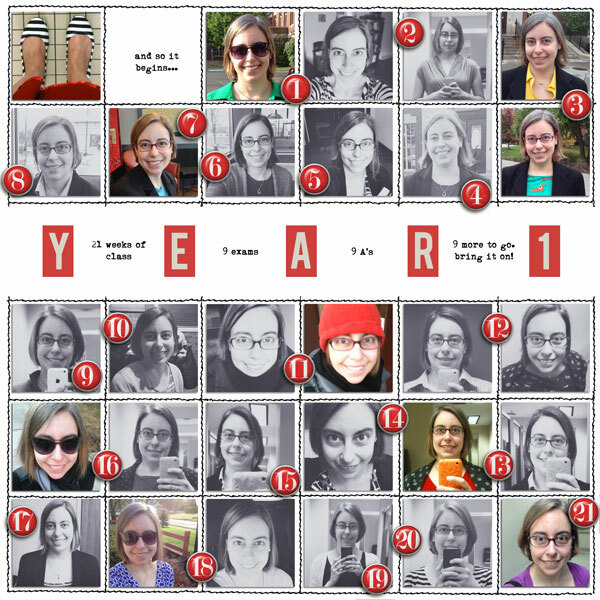 Use a collection of photographs from years' past to put together a compilation layout. That's it! 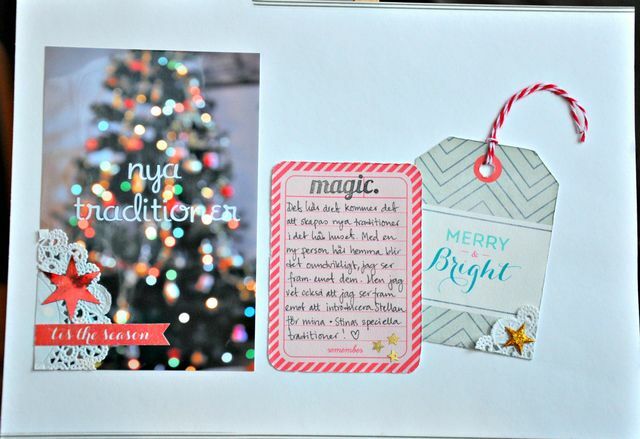 18 more ideas for creating amazing pages. And only four more days until a brand new gallery to inspire you even more! Thank you for stopping by!! 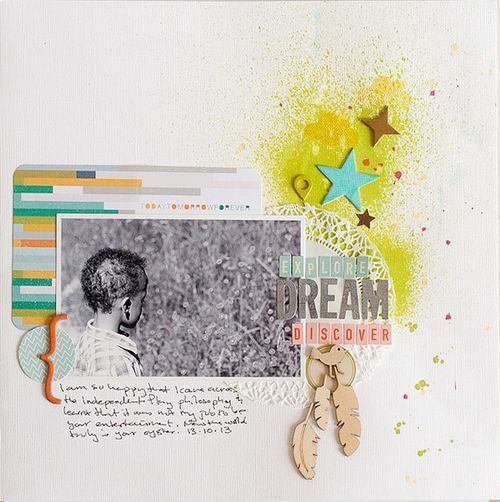 This month, our gallery theme was Dreaming. In a season of reflection and gratitude, it was lovely to think of our hopes for the future, too. Pages such as these are a lovely time to make use of those extra photos or those headshots that don't have specifically attached stories. Let's find a few more tips and tricks as we look back through the gallery. 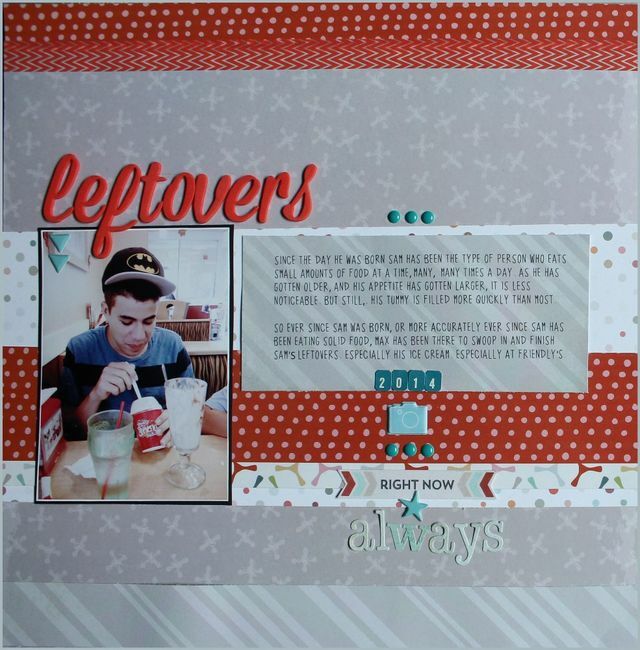 Carey's use of a coordinating font makes her layout unified. And resizing a digital poster to use as an embellishment was genius! 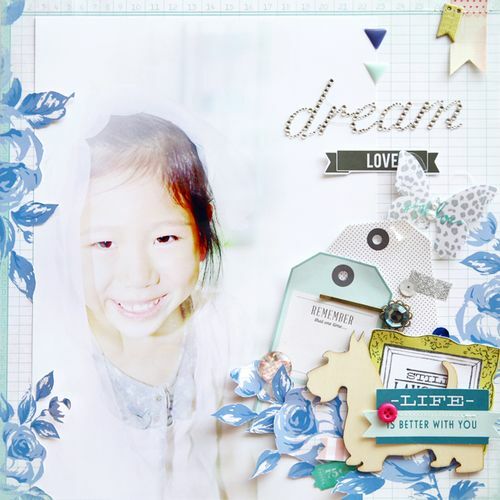 The dreamy gauzy look and disappearing edges on Jina's photo help to set the scene for this layout. 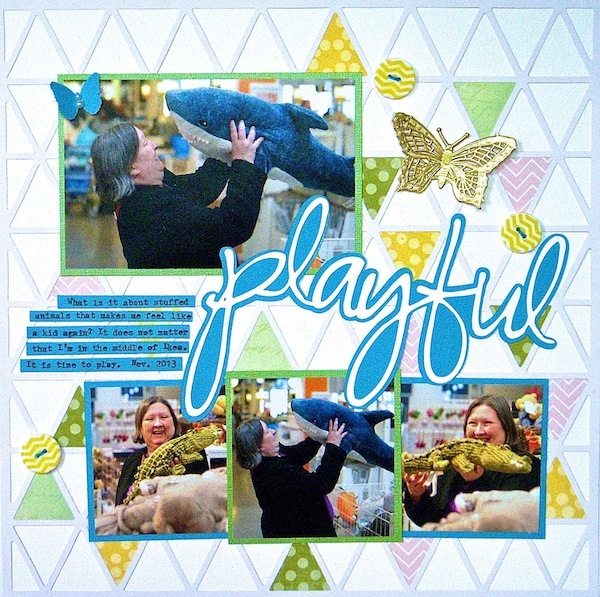 The blues in the layout also add to the dreaminess. 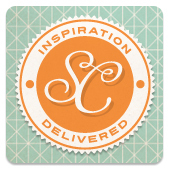 We all have pinboards filled with lovely images that inspire us. Jennifer's photos are from her Pinterest account. 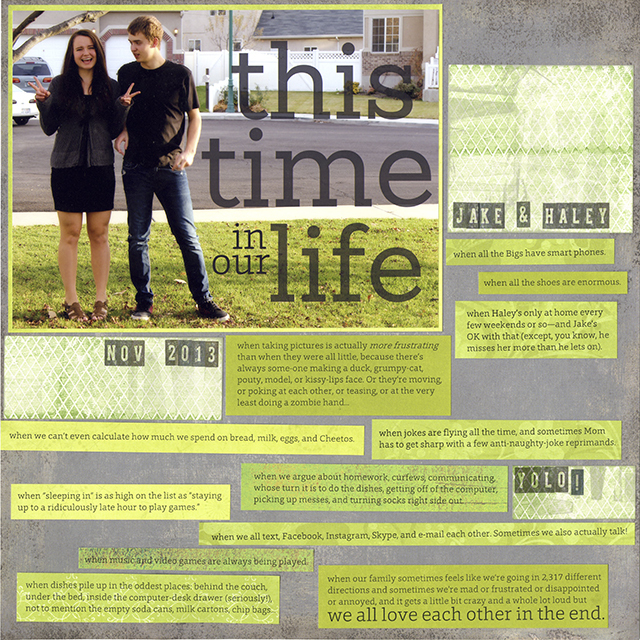 It is a clever way to both document our current interests, and to add a visual interest to a layout. Cristina was brilliant in painting with a dab of green watercolors behind her white letters. The paint sets the letters off perfectly, drawing your eye immediately in to the title. 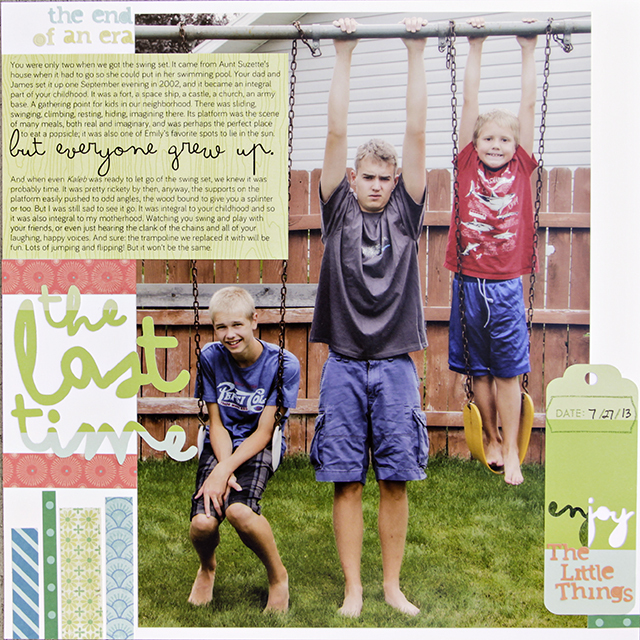 Amy jotted down a few hopes she has for her boys. (And then paired it with a photo that makes a heart hurt. Lovely!) Letters to our kids needn't be long nor fancy. Even when the page is serious and heartfelt, it can still stay true to your sense of humor. For instance, Valerie's title lets her personality shine through. And is the perfect addition to her page. What do you dream about during the long winter? 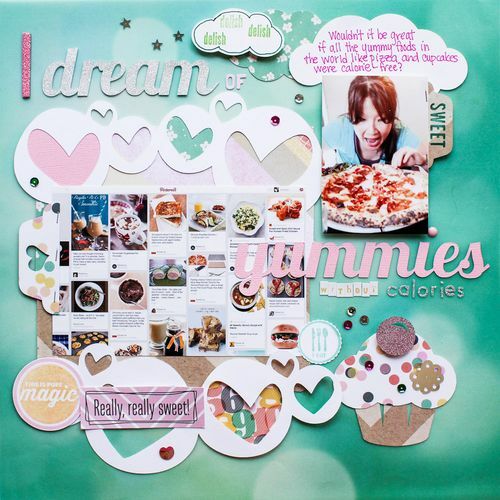 Laura used a lovely summery photo to show what they are dreaming about. You don't have to use photo from the day you were dreaming. One that's the subject of the dream works, too! 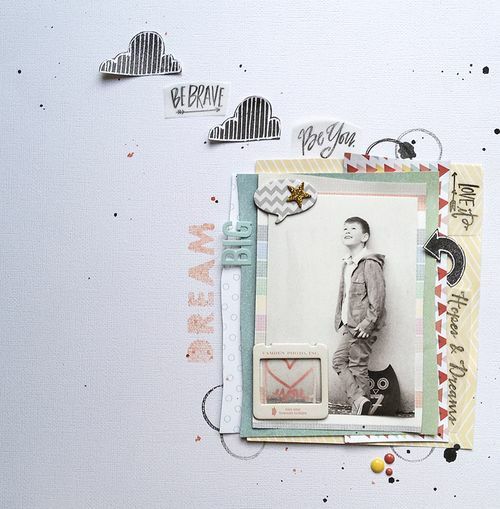 This layout is gorgeous! 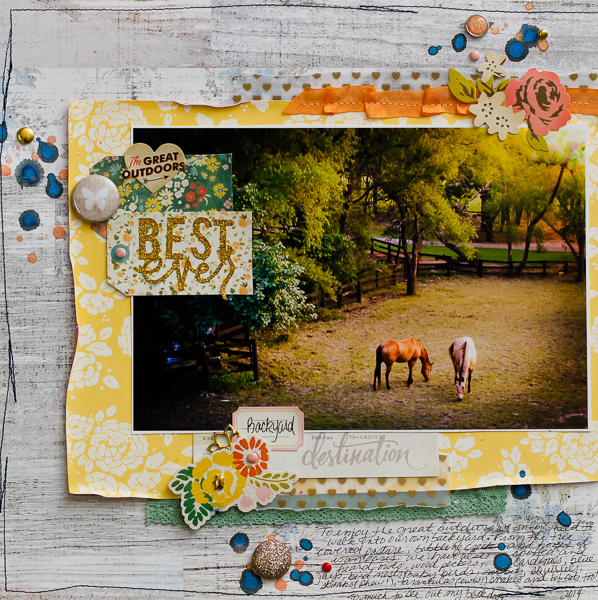 With its diagonal line, tone on tone title, and bursts of complementary yellow, Amy outdid herself on this one. Much to love and emulate here. Ann's lovely photo is a terrific reminder that catchlights are an important part of a good portrait. Be sure to have a bright light source reflecting into the color of your subject's eyes. Windows. Sunlight. Reflectors. Whatever brings you light. Not only did Jenny use a photo of herself (Go Jenny!) but she also took a moment of introspective reflection. The result? A meaningful page that will be a lovely memento. Diane's layout would be the perfect design for photos from your phone. With quality restrictions for blowing up phone photos, this would be a great solution! Lisa's photo is perfect. What a lovely moment to capture. Get out the tripod, or enlist a helpful teen. And if they are too scared of taking a photo without faces, you can always fix it up in photoshop! Sue is seriously knitting socks! How great is that? And how great that she wrote about it? 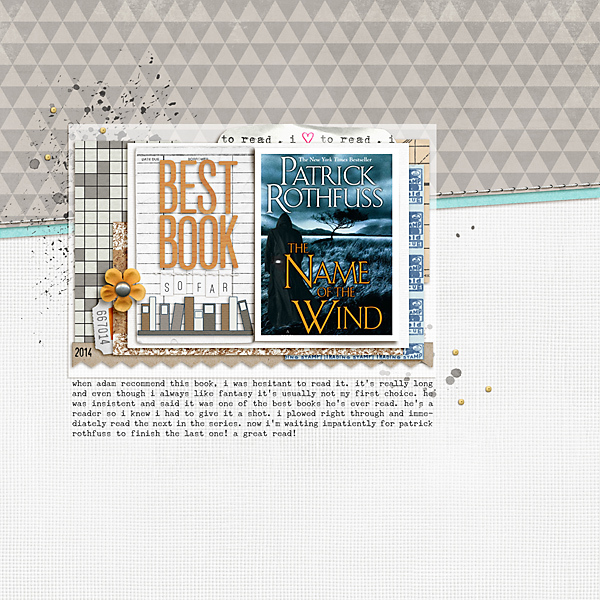 And the clouds, stars, and the starfilled paper are a wonderful backdrop for the her story. Rounded corners. They may come and they may go, but they will always there. And we will always love them. As much as we love photos of happy love. Thank you, Lisa, for sharing and inspiring us! Francine's wooden elements are so on trend right now. 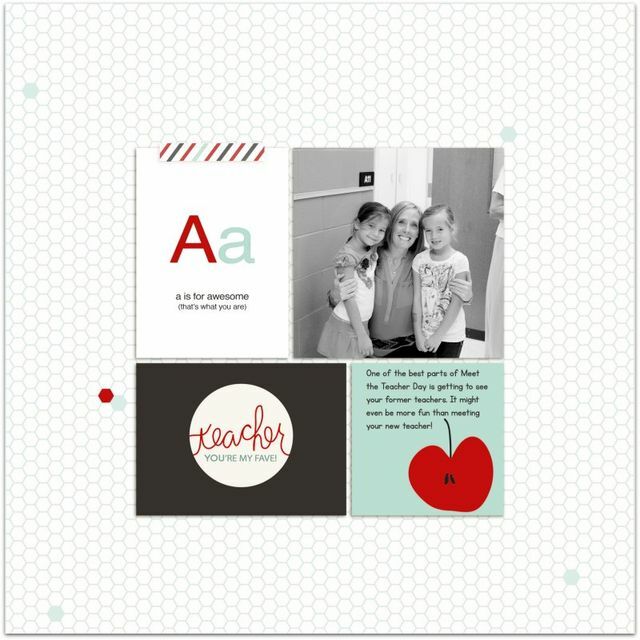 They are a multipurpose embellishment: they are a graphic to help add to the story, they are neutral and grounding, and they add a natural element. Oft times, the thing that makes a layout gorgeous is the details of the accessorizing. 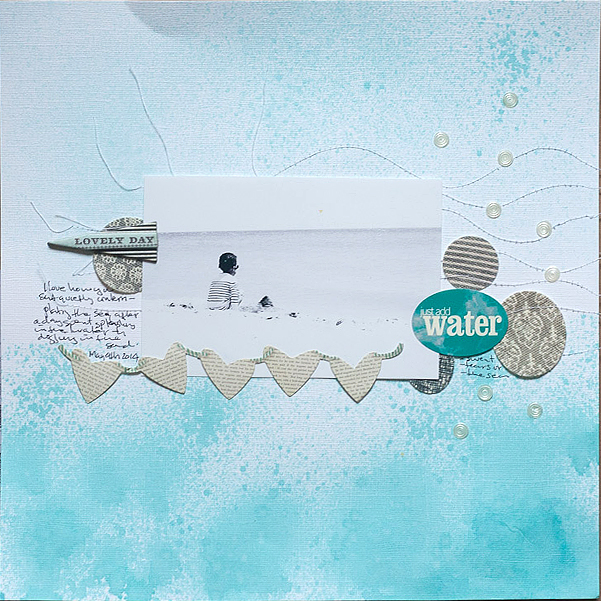 Monika created lovely texture by creasing and rolling the corners of her layers. She also placed her adhesive carefully so as to allow the layers and shadows to shine. Mmm. 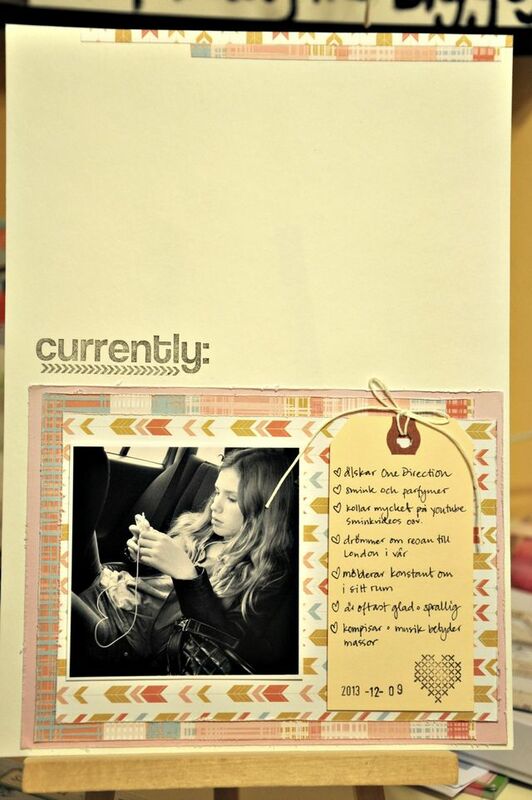 Not only can we show off our humor with our journaling, but we can do so with our photos, too! Look at Christine's pretty mug--inhaling that pizza!! What a fun page! 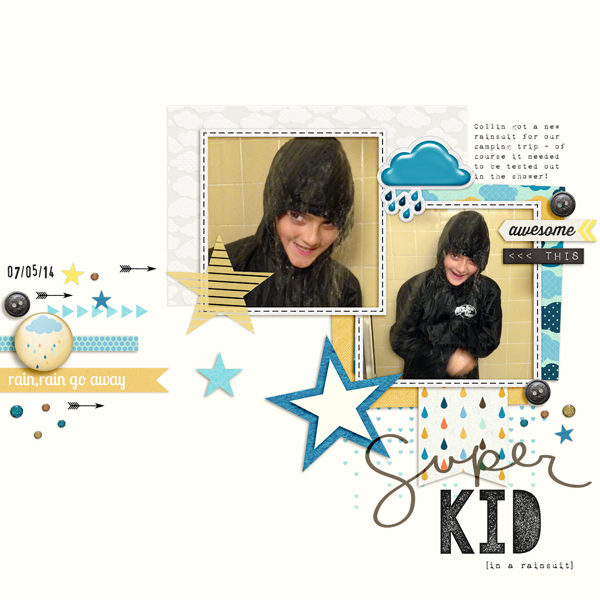 Stephanie's journaling includes the hope that her children remember to dance in the rain. Made all the more poignant by the photo of dancing in the rain. What a lovely use of this photo. And the washed out filter makes it even more ethereal. This photo rocks! And is a wonderful backdrop for a story about the things facing a teen on the brink of adulthood! and college! If you need a photo like this, turn your aperture to a low number and your background will blur away! WaiSam has such a talent for vignettes. 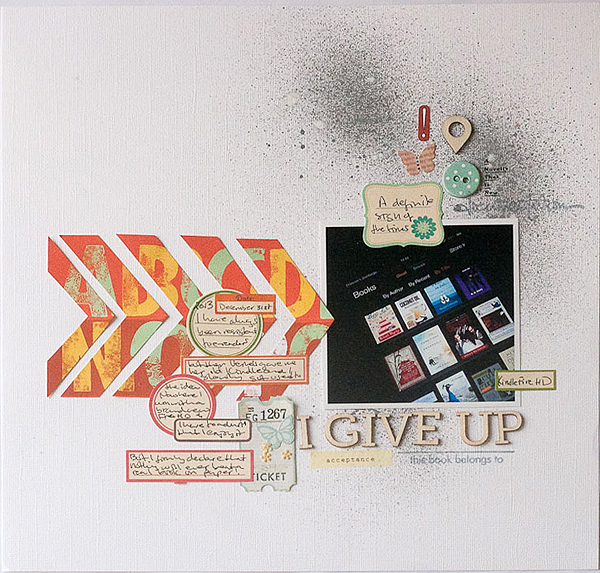 On this layout, her repeated use of the doilies connects each of the collages into a greater whole. Look for elements that you can use repeatedly to help create a similar situation. Never underestimate the power of a list! 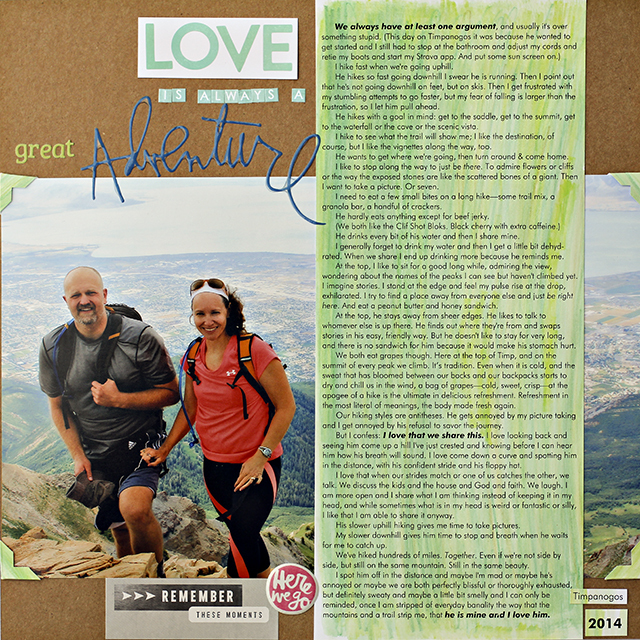 Keshet's happy list is a gentle reminder that we don't need a lot of words to say a lot. 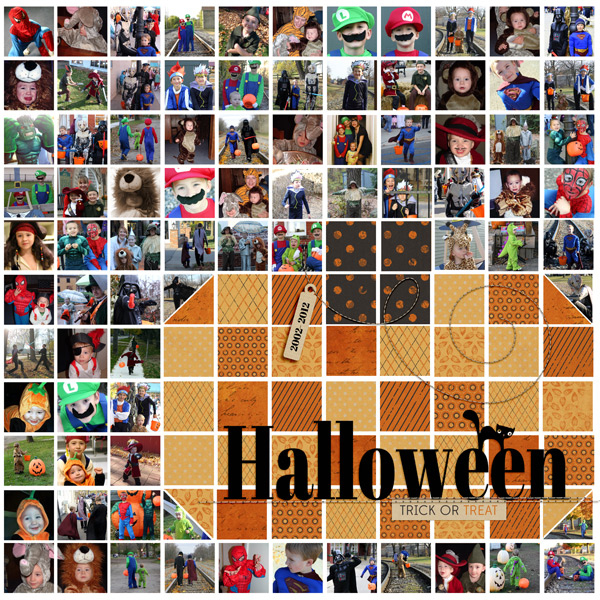 Not only did Aliza get photos of her boys in costume, but also got them in character. What a great idea to pose them! It makes the photos come to life. This would work for Halloween photos, or any that have a story that includes movement. September isn't just filled with glorious color outside, our gallery was a wonder this month. The color palettes were splendid and inspiring. Hundreds of color combos can be had from the 24 that were showcased. But there is more to the gallery than just the color. Shall we look together? Thank you, for stopping by! 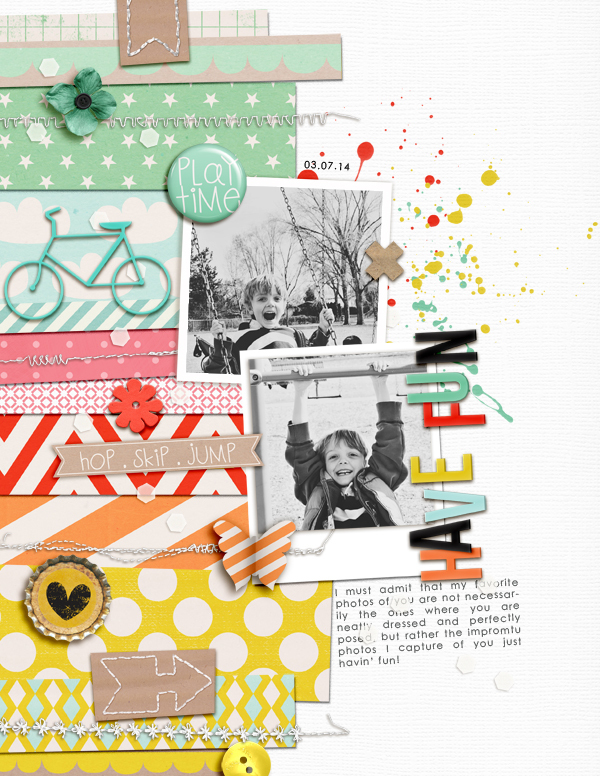 We hope you enjoyed our colorful layouts and that you have found additional inspiration today. 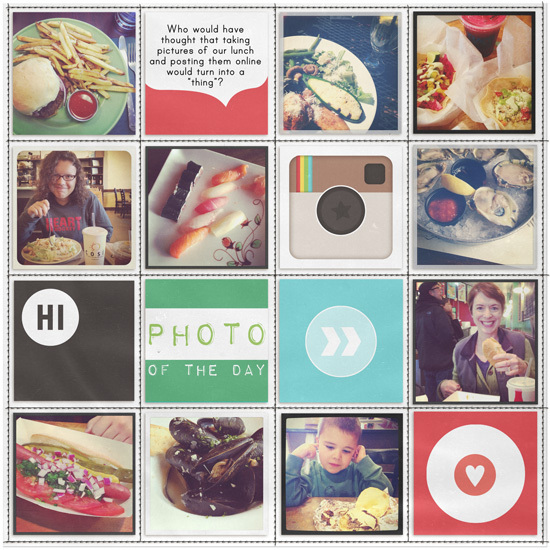 Leave us a word if you think you can determine our new theme! Have a wonderful weekend.